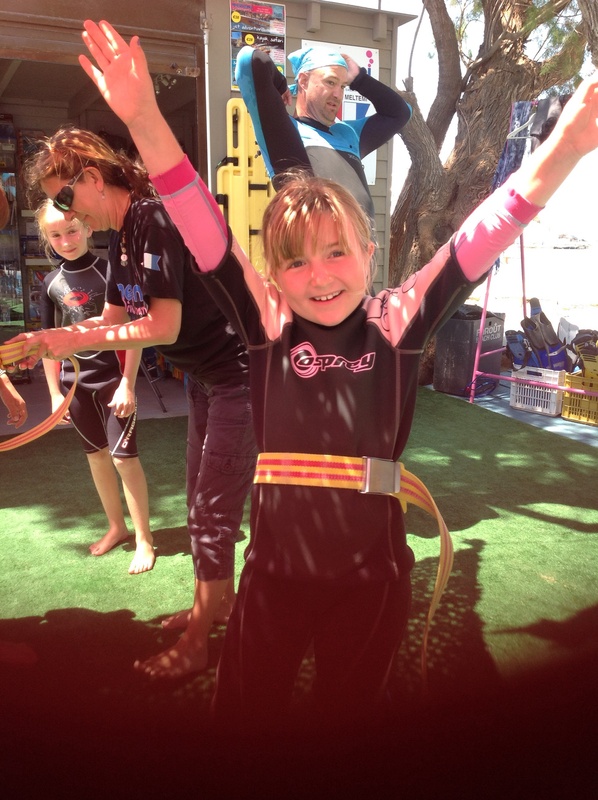 Scuba diving was too good for words…….but I’ll try to put it in words. It was good right from the start because the instructors were our friends and we’ve known them for about 5 months. They are Jason and Kate and they were awesome instructors. We first met them in our Greek class and started talking, we found out they owned a diving school and they were in Crete for the winter. 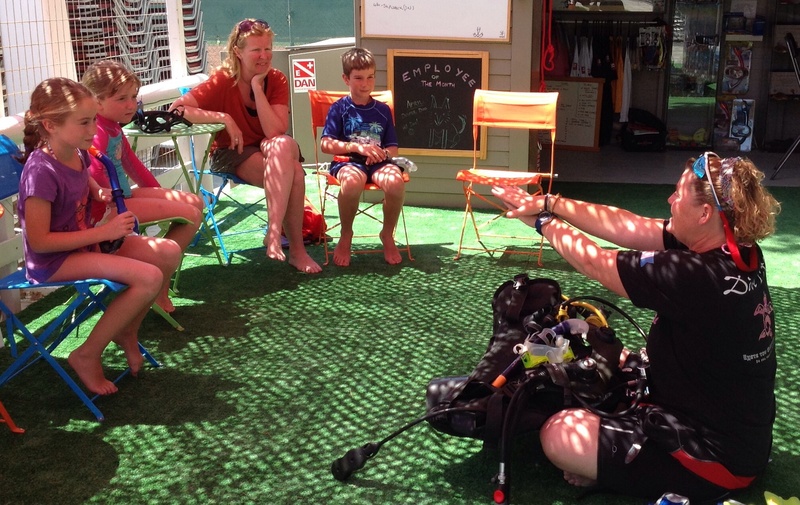 They first told us some safety instructions and how you know the difference between a good dive school which will keep you safe or a dive school that doesn’t take as much care. 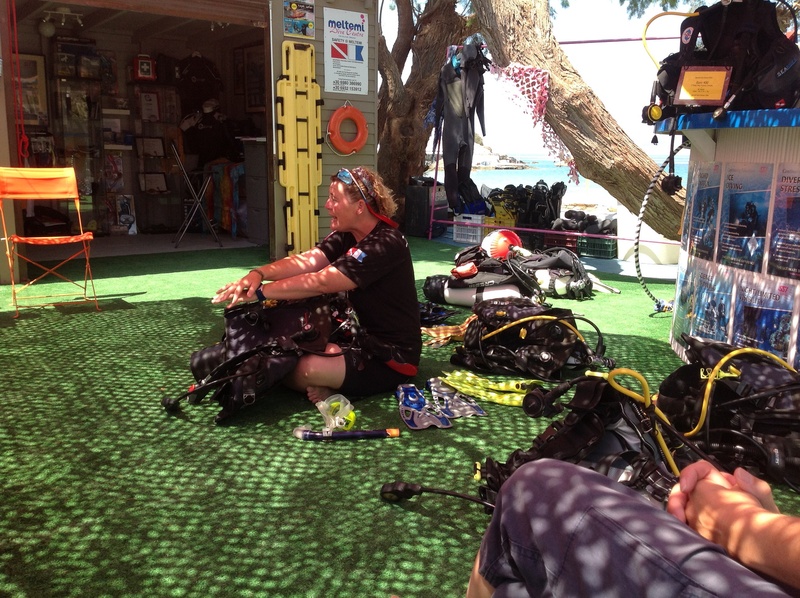 One of the tips they gave us about knowing a good dive school is looking at the equipment before you sign up. 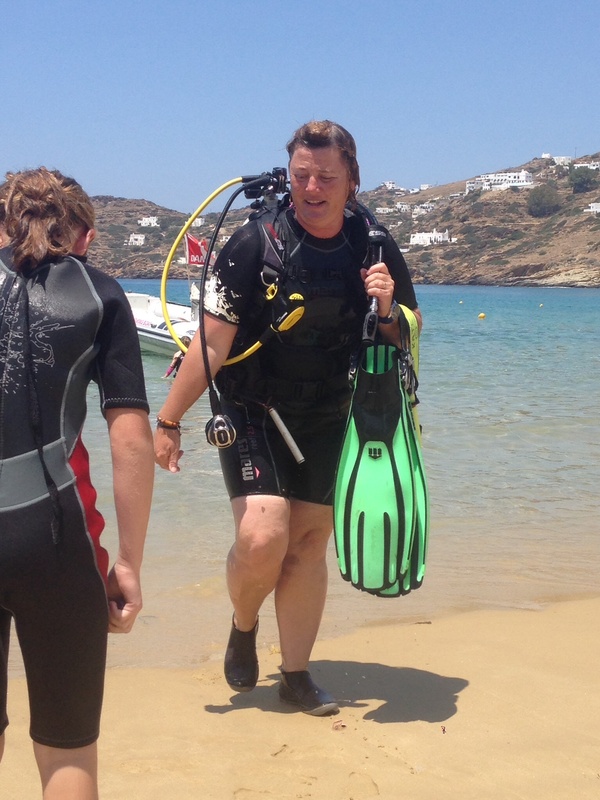 If the equipment is all sandy then go to another dive school. Or if they don’t have a spare breathing tube go to another dive school. 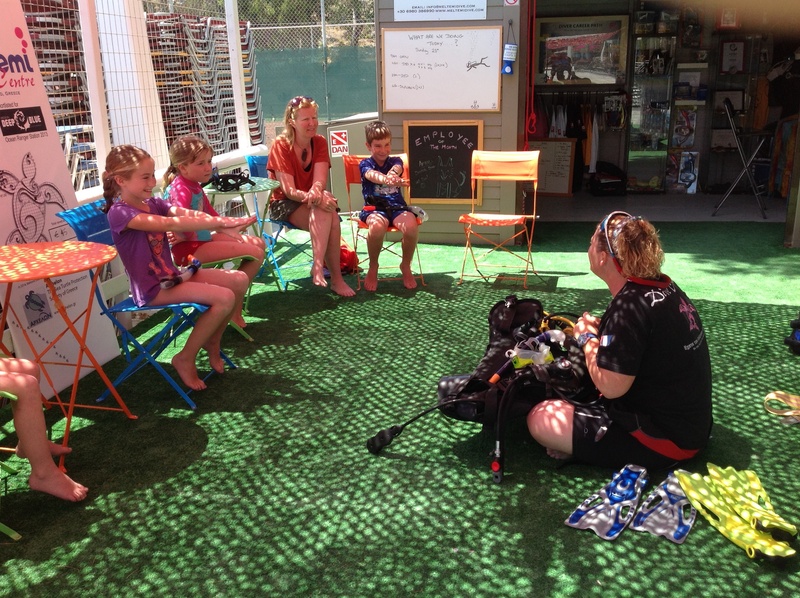 We learnt: how to breathe with a regulator and how to be safe with a regulator under water, how to take it out and put it back in and then blow out if something was wrong or if you had to spit. You could even cough, sneeze or vomit in the regulator and then press a button and the regulator would clear out for you if you weren’t trained to blow it out yourself. They said it was best not to vomit in the regulator. The final rule was to have fun and the most dangerous thing about it was not getting hit by the bus when you’re walking across the road to the beach. 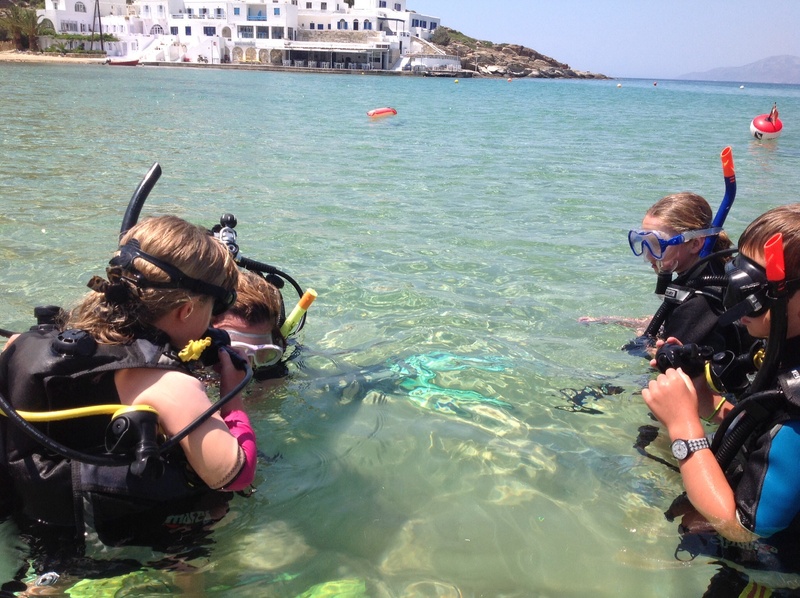 Their dive school has won an award as the best in Greece and the third best in the world because they are so good at safety, do a lot to care for the marine environment and they are such good teachers. The funnest thing about it was we got to swim through hoops and throw an underwater frisbee. We saw lots of fish and these spongy things – I think they were natural sea sponges. I even saw some moving coral which Kate later told me was a live coral. 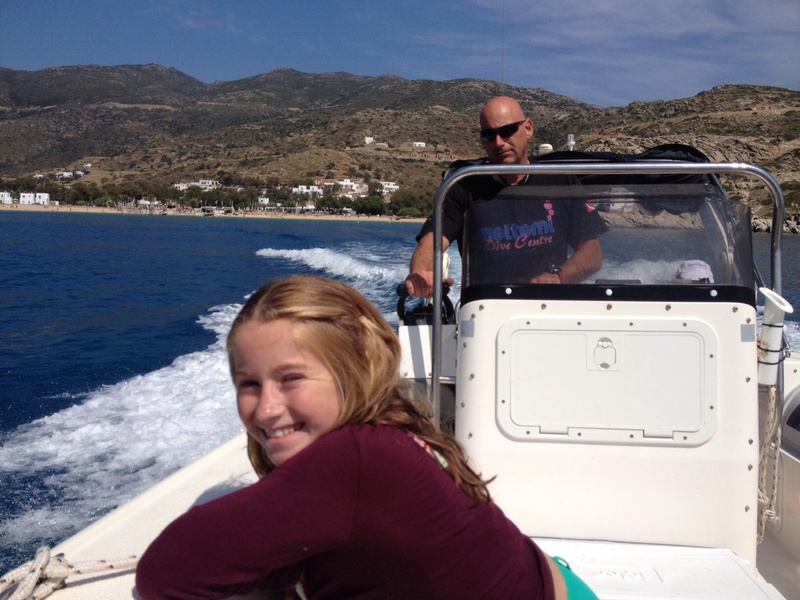 This afternoon our friends kept a free day for us and took us on their own speed boat which is the fastest boat on the island and took us out to a wreck. 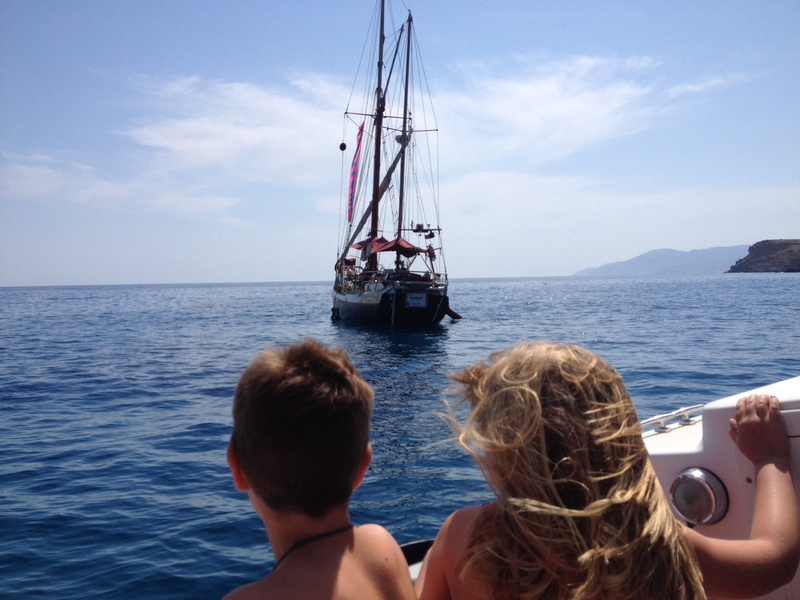 It was very very fast and when we were at the wreck we anchored and then jumped off the boat and had a little snorkel. We saw fish and more fish and a little bit of the wreck. The wreck was wrecked 40 years ago when a cargo cement ship was going to the port. It rounded a corner but rounded it too soon and they ended up on the rocks. The front of the ship got broken in half and split up everywhere and the hull was what we saw. The people on the boat did not get killed – they just went to the rocks and spent the night on them and walked to the main town in the morning. Two years later an almost identical boat carrying cement also got wrecked on the other side of the island. On the way back Jason taught us what he had to do if someone fell overboard. He told mum to throw out a floaty and we were going pretty fast. Then Jason tuned the boat so quickly that the inside of the boat went on its side and almost felt like it was going in the water but the pressure kept us in. Later Jason told us that we didn’t even need to hold on cause we turned so fast and the pressure would hold us in like when you swing a bucket of water. My dad says this is called centrifugal force. We got the floaty back pretty quickly and that’s what we would do if someone fell in. 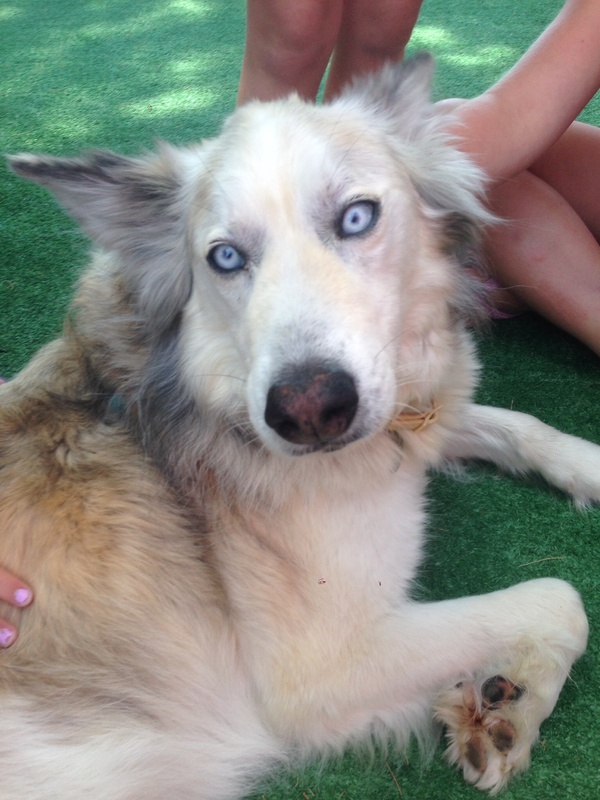 Deefer is their Siberian husky dog with pale blue eyes that lives with Jason and Kate on their boat. 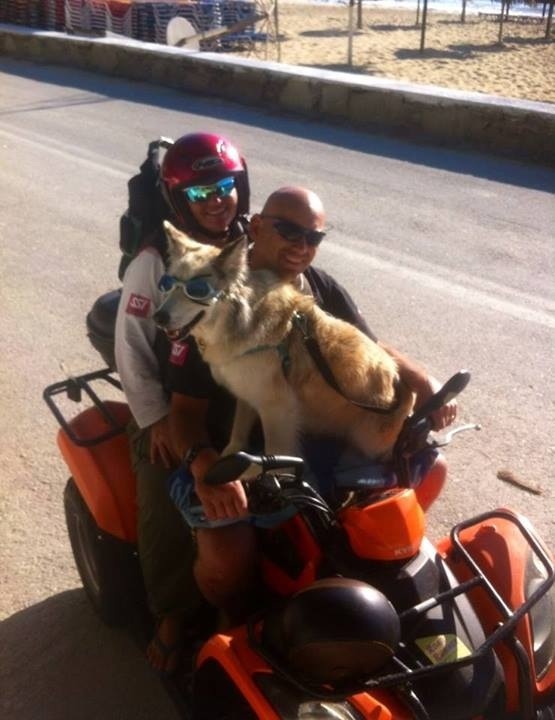 He has been on ferries, planes, boats, quad bikes, buses, motorbikes and all kind of things like that. Even on a jet ski. He has even got his own doggles which are special goggles that he wears on anything that goes fast. If he goes to a snow area his pale grey fur goes really really dark which is like opposite to a suntan and probably protects him from the cold in some kind of dog way. We actually just watched a movie called ‘8 Below’ with some Siberian huskies and it is an amazing movie. When watching the movie I also realised that when the dogs were on their own that was the made up part of the story – the rest of the story was true because when the storm came in and they evacuated they didn’t know what the dogs were doing cause no one was there. It’s an awesome movie and I really recommend it. I would love to get a husky but huskies don’t like to be alone for more than two hours so that wouldn’t work for us because we are at school or work for much longer and couldn’t hang out with it. They like to live with company or in a pack. 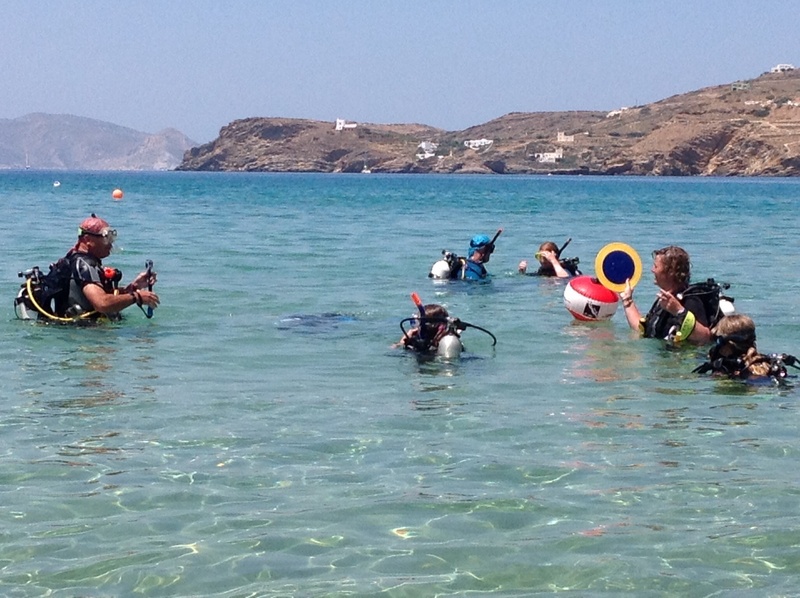 We came to Ios to go diving at Far Out resort with a diving school called Meltemi. 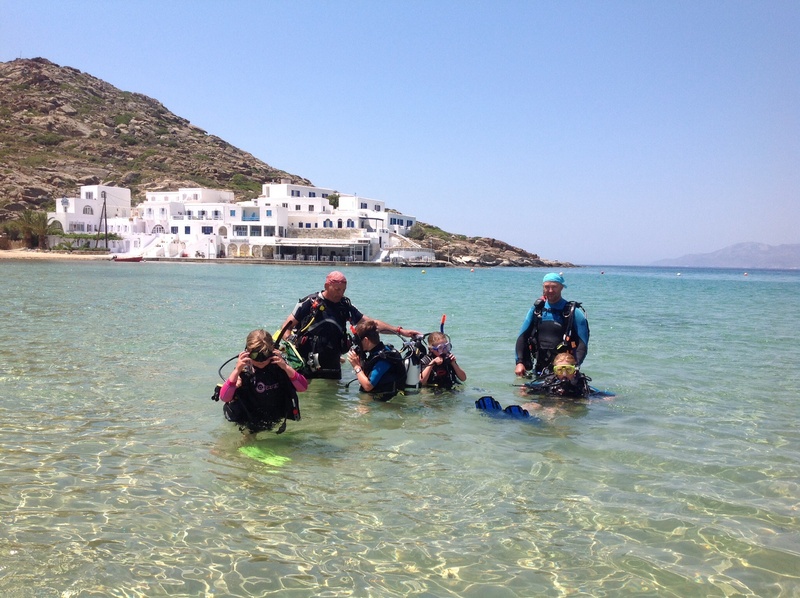 We met the diving instructors from our Greek class in the winter in Agios Nikolaos. They had their boat at the marina near our house and we became friends. 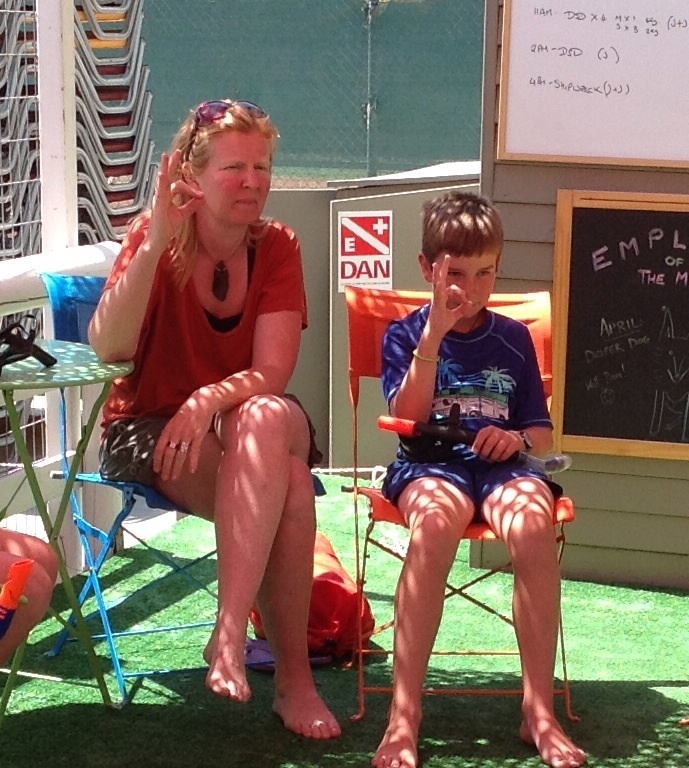 They are from the UK and they gave up their jobs in banks to start up a dive schools and live on a Sail boat. The diving was an amazing experience. 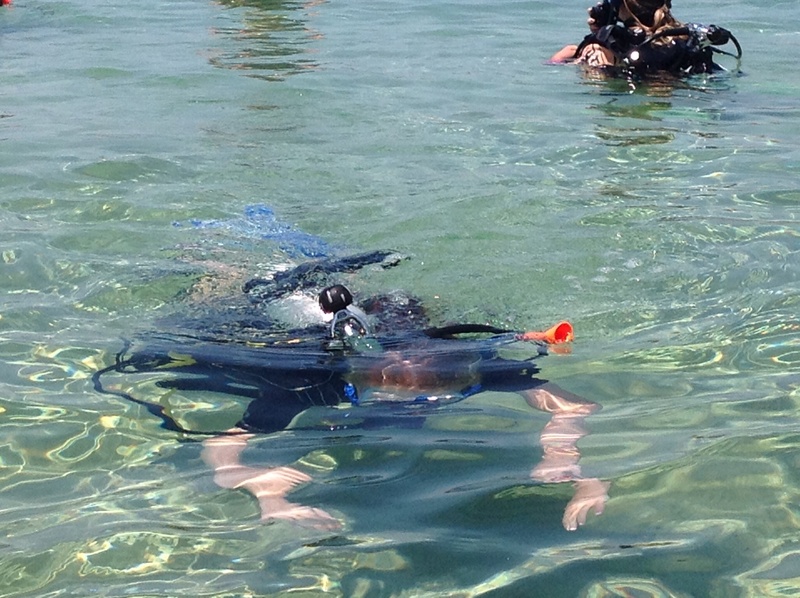 I loved seeing how the equipment worked and seeing all the fishes and sea plants in the water. 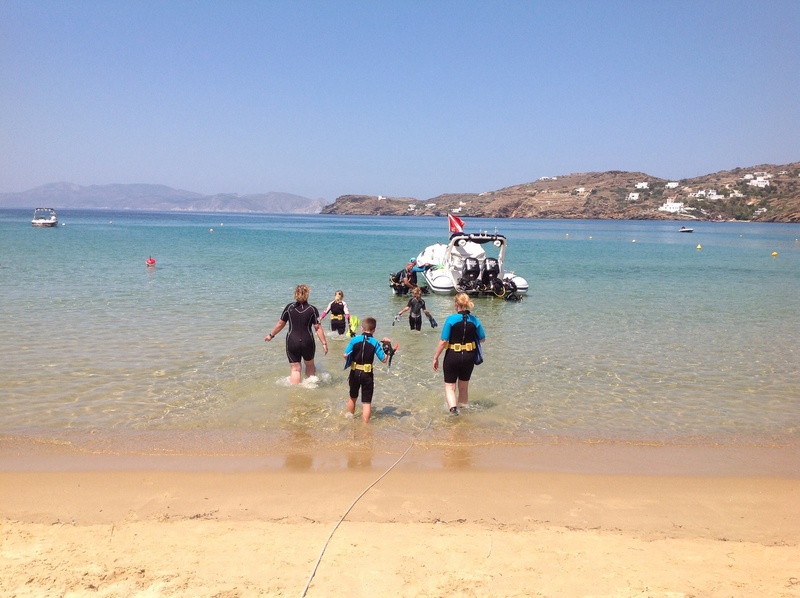 We learnt how to dive and be safe in the water. 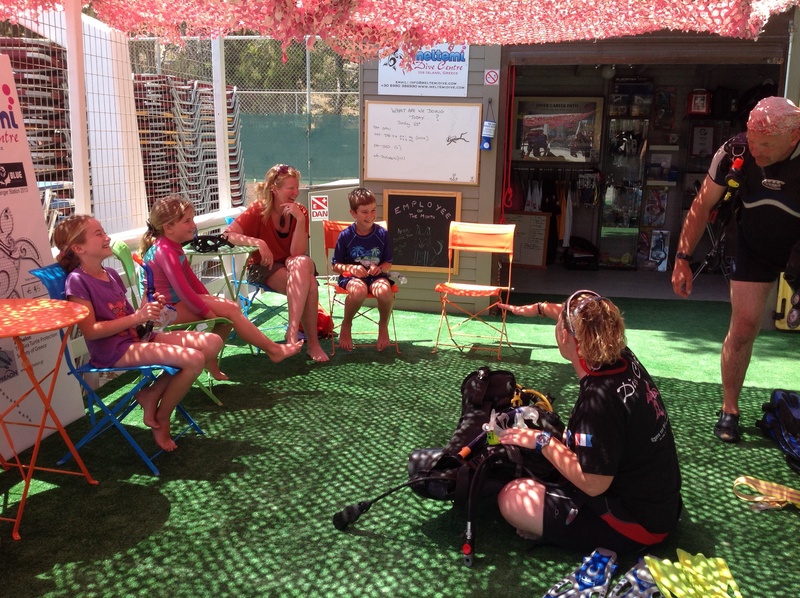 We learnt that if equipment at diving schools is all messy in a pile and sandy then you should find a different school. If they say that you don’t need permission from your parents then you shouldn’t go with them either. 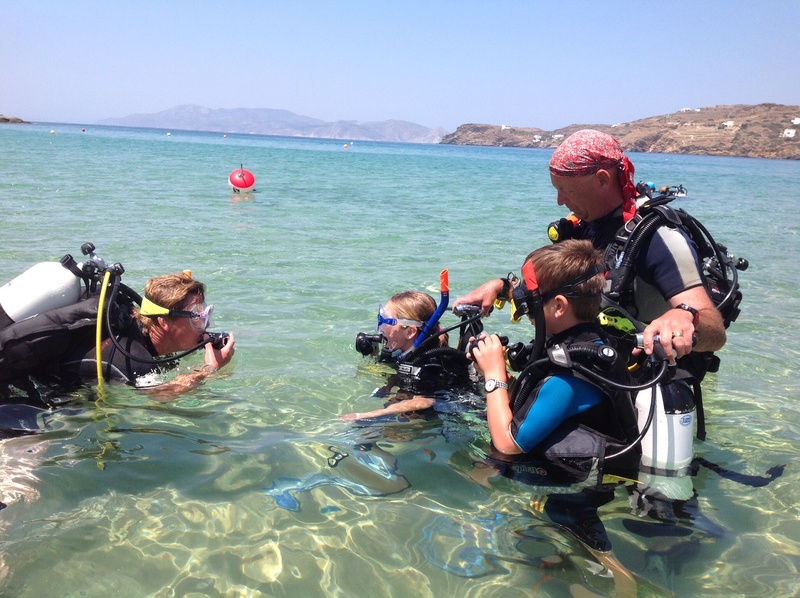 Underwater you can’t talk as you know, so we learnt some hand signals – if you put your thumbs up it means you want to go up to the surface and thumbs down means you want to go deeper but you must have an Instructor with you. A circle with your thumb and finger like an ok means all is good. I was with Katherine and Kalika, Toby was with Jason and my mum was with James. Most people had to wear heavy belts to make them sink further but I didn’t have to wear a belt because the weights were inside my pack. The oxygen was very dry but it was clean healthy air. It made our throat dry and we needed to drink water straight away after we got out of the water. In the water we swam through hoops and touched tyres, chased each other and played underwater frisbee. We stayed for about an hour or so under water but it did get a bit cold after a while. 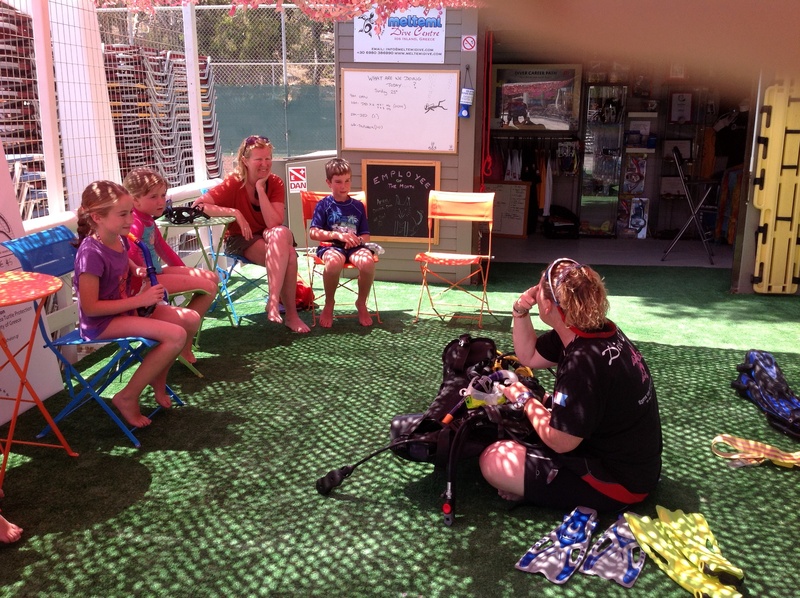 The instructors, Katherine, Jason and James were very patient and calm and very nice people. They obviously love what they are doing. In the afternoon about 3 o’clock Jason and Lynne (who works for them and is doing her dive instructor course) took us out to see a wreck. We snorkelled above it and it looked very beautiful. The colour of the water was crystal blue. One night about 40 yrs ago there was a concrete cargo ship delivering some concrete to Ios – it was aiming for the port but missed and landed on some rocks. The boat split apart and the people basically walked off onto the rocks and didn’t get hurt. They walked into the main town in the morning and told them they lost their ship. About two years later almost an a identical ship carrying concrete also was shipwrecked on the other side of the island and no one got hurt then as well. When we were diving there were black sponges in the water and what happens when people get them – they drain the water out and let them dry and then use them as sponges. It was a very exciting day and Katherine and Jason said we could come back and get a job with them in seven years time. Scuba diving was awesome. 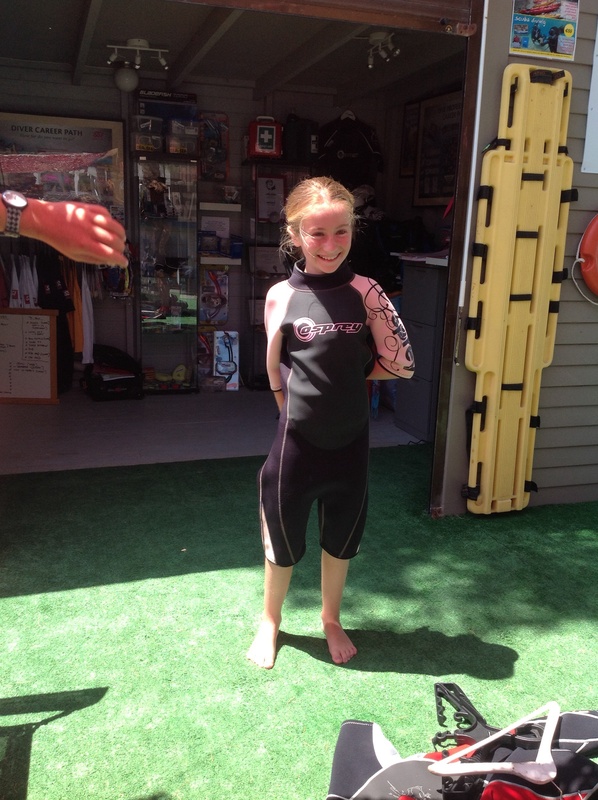 We went scuba diving cause it was one of my birthday presents from mama and baba. My favouries thing about it was swimming through the hoops and wearing the tanks and jacket. They were very heavy but they weren’t heavy in the water. You can make the jacket into a sort of life jacket by pressing a button and there is also a button for deflating it when you want to dive deeper. 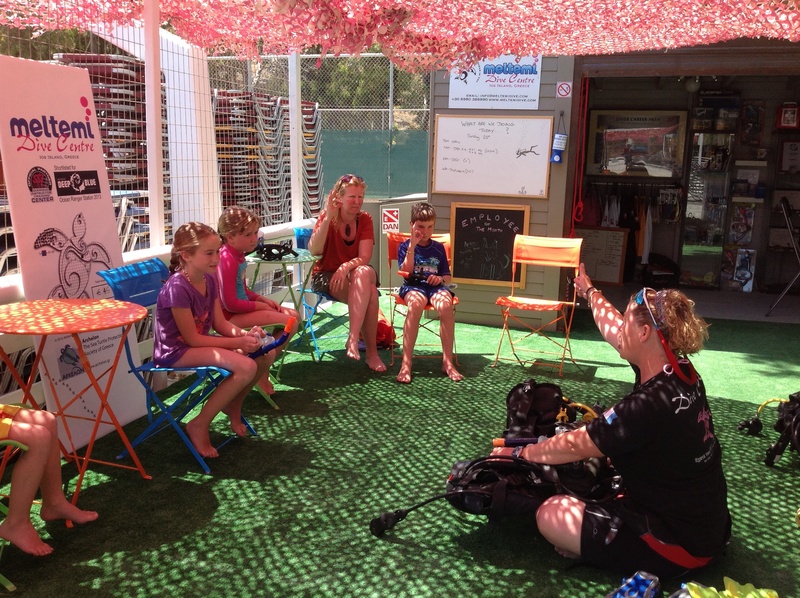 We went diving with our diving instructor friends Kate and Jason and their helper James. We played underwater frisbee. In the water we saw lots and lots of fish and I saw some natural sea sponges. It was hard breathing but I got the hang of it pretty easy. 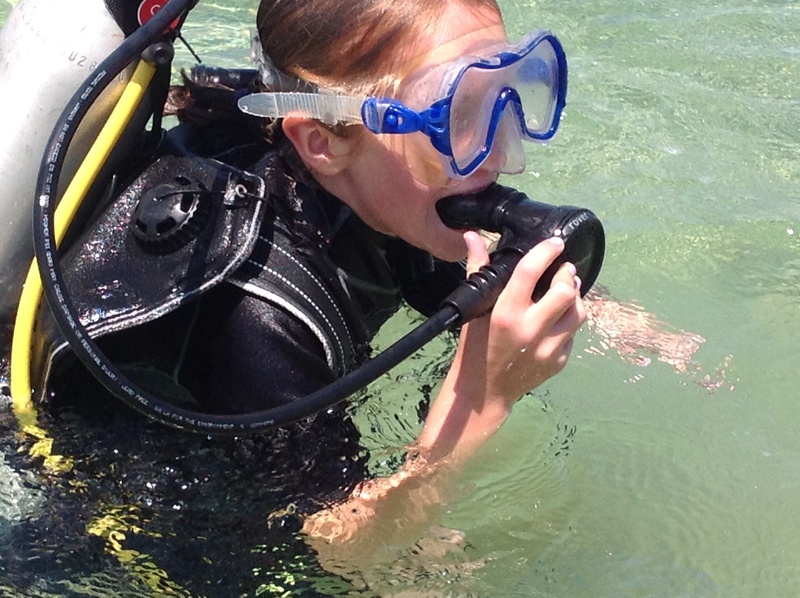 When I’m older I would love to be in a dive school. Katherine and Jason said when I’m 18 I can come and work for them. It was the best experience in my life and I want to say a thousand thank yous to them. My birthday was the best one in the world so far. This is because my parents got me some tickets to go to the One Direction concert in Paris on the 21 June this year. I really love their music and them. I’ve been wanting to go to a concert ever since I heard about them – which is about a year or two ago. Mad aunty Desley got me a one direction DVD about them and what they do when they are waiting to go on stage and the concerts. Desley was the first one to give me a present in the morning and I just squealed so loudly. 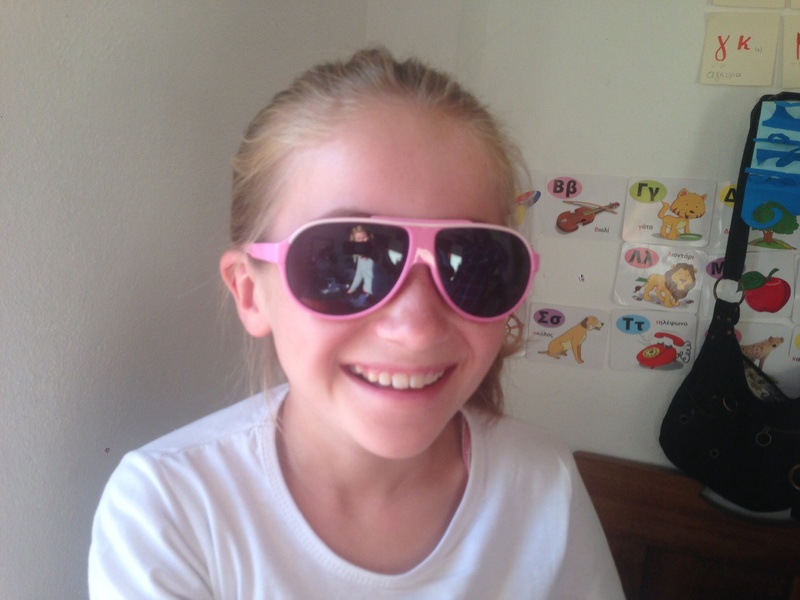 I also got some sun glasses, hair ties and a head band which are lovely. My parents didn’t want to buy things that we get to keep because we are going travelling soon and will give most of our clothes and other stuff away. 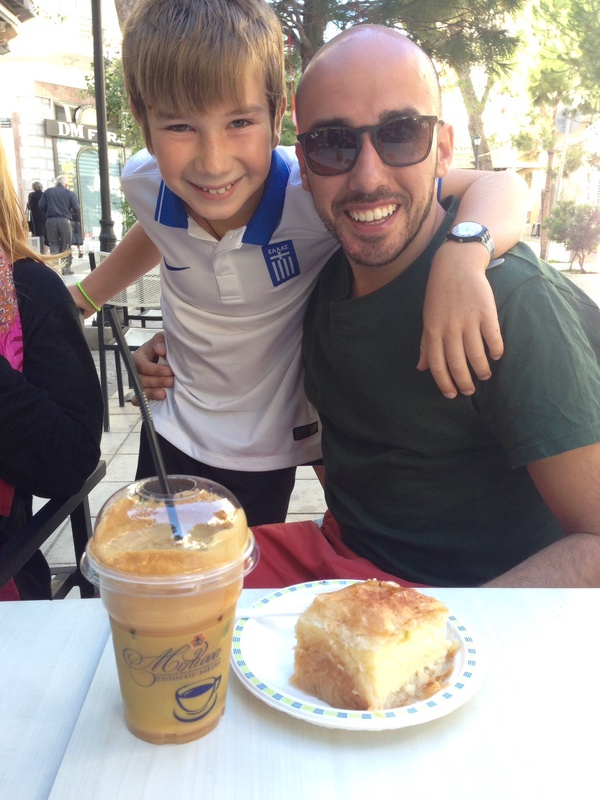 When we finished our Greek class that day and picked up Zoi and Emilio (Kalika was still at school) baba and mama took us to Dodoni – our favourite ice cream shop. Zoi and I shared a waffle with chocolate and strawberries and ice cream on top. 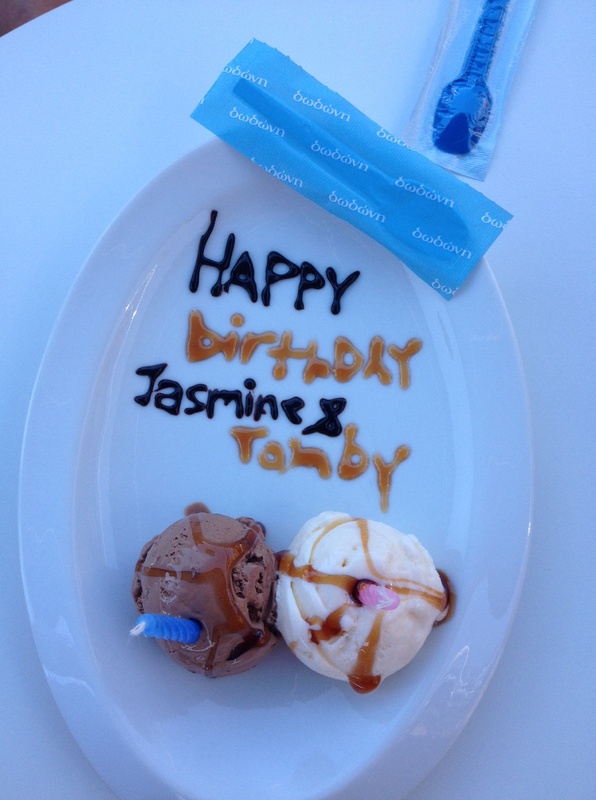 Mariana – who is the Dodoni lady brought out ice-cream with candles and wrote happy birthday and our names on it. It was so nice of her. 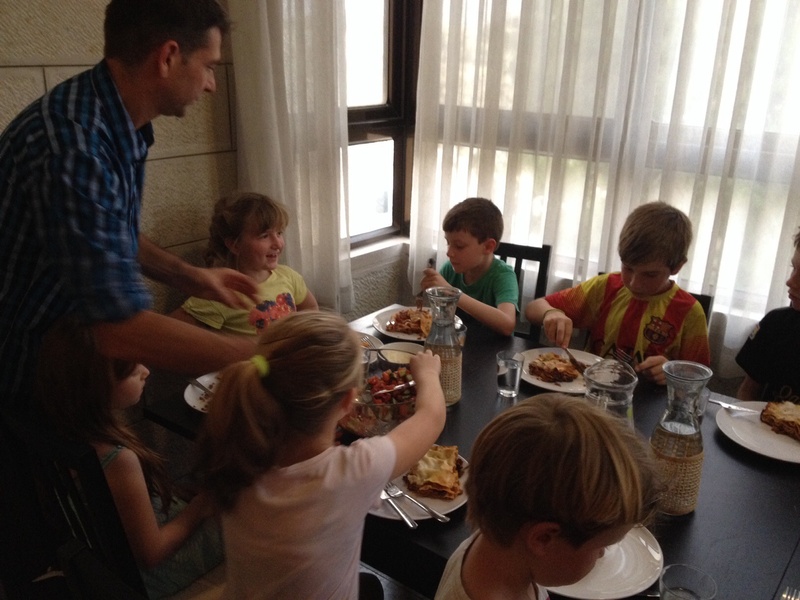 On our birthday we get to choose what we eat – Yiayia made us snitzel and mama & baba made us mashed potato which was very yummy. For dinner we went out to a Restraunt called Gargadoros which is near our favourite beach. We had calamari, potatoes, pork gyros and lots of salads. 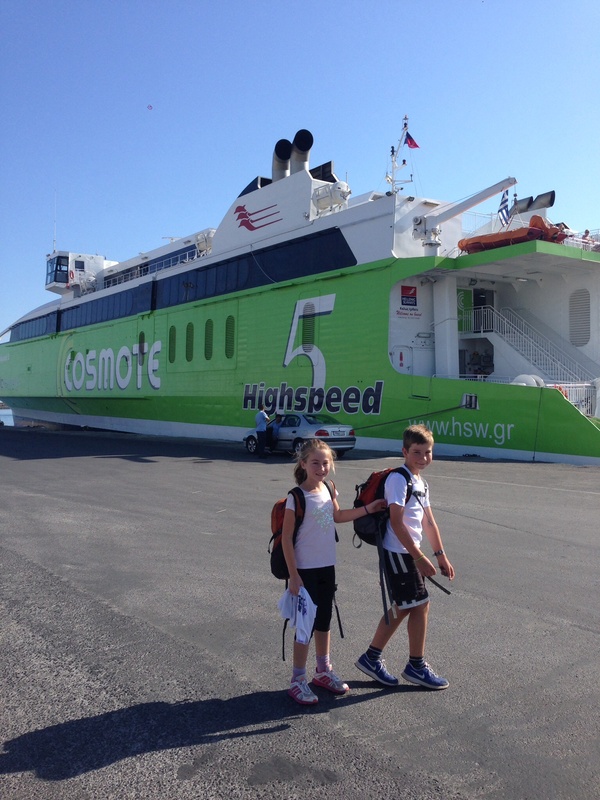 Now we are on a bus to go to the Heraklion port to get a ferry to go to Ios – an island off Crete where we met some friends at our Greek class (they are English) and they run a scuba diving school and are going to teach us to scuba dive for our birthday. I’m very excited. 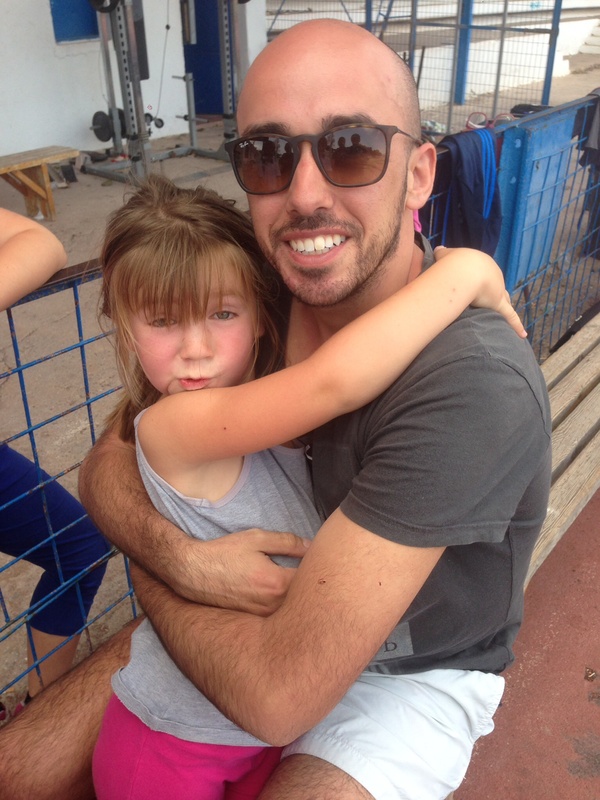 Chich – George – the rock star uncle! 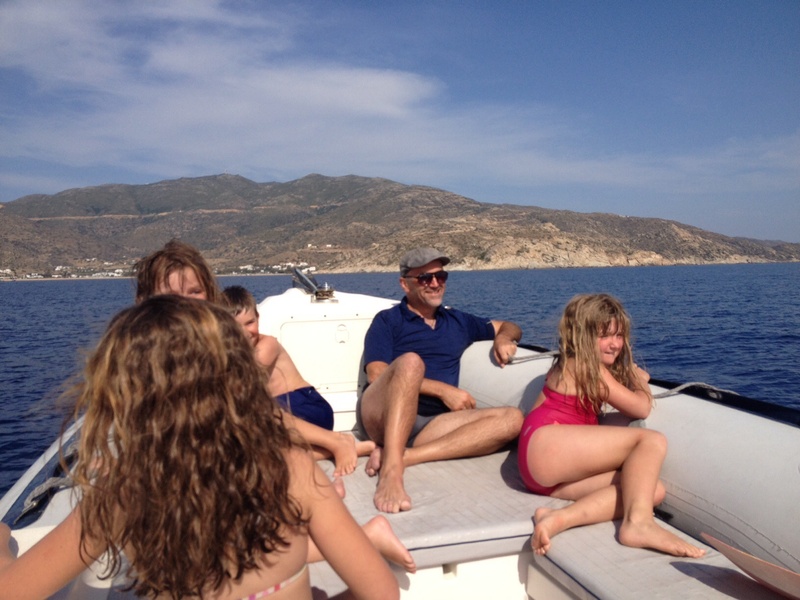 We had lots of fun and then we went back home and had even more fun playing games – some of the big kids were doing homework – Chich is the best uncle in the whole entire world – and Ricky as well don’t forget – he’s cool. Chich is my nouno as well and Sally is my nouna. – that’s all love from Moochie. How many people can we get into one selfie? Chich thought the fishes might like the dead skin on his feet! Chich came from London to see us for only 2 days but it was awesome that he came. I liked going to the beach with him – he sun baked and we ran around and played with the sand and got in the water to swim. 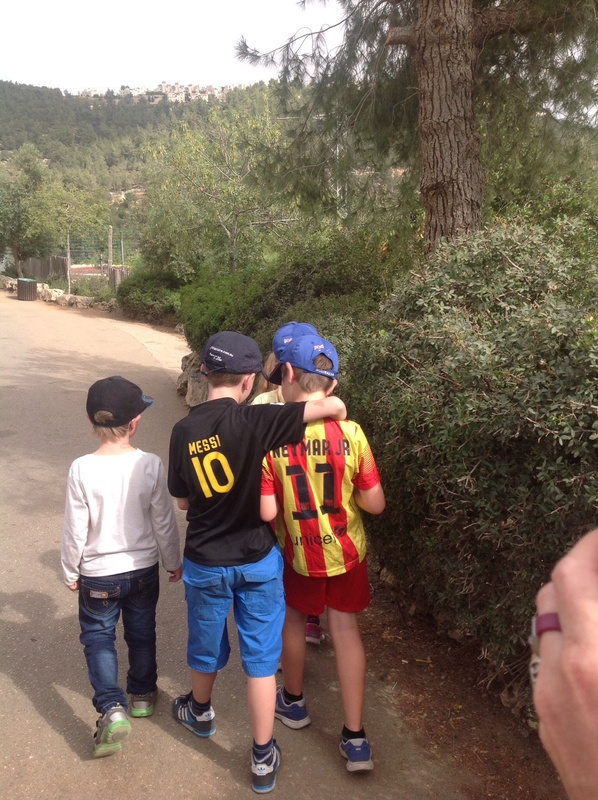 It was funny how Toby and Yasi were telling Chich off for having his T-shirt off on the way back from school but he was hot and wanted to get some sun. 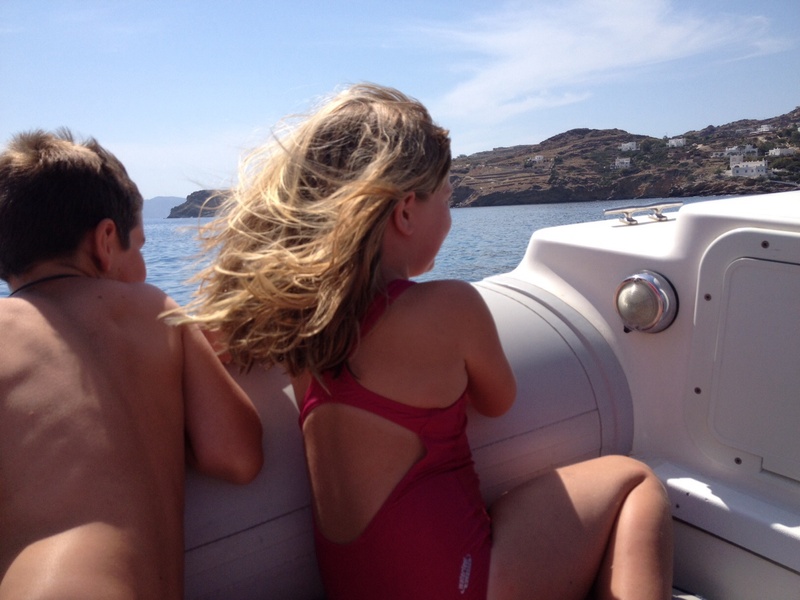 When we arrived home Chich was saying ‘hello strangers’ to mummy and Moochie and Zoi and they were saying – ‘we’re not strangers’ and Chich said ‘I don’t know you!’ It was so funny and Chich had his top off which made it even funnier. 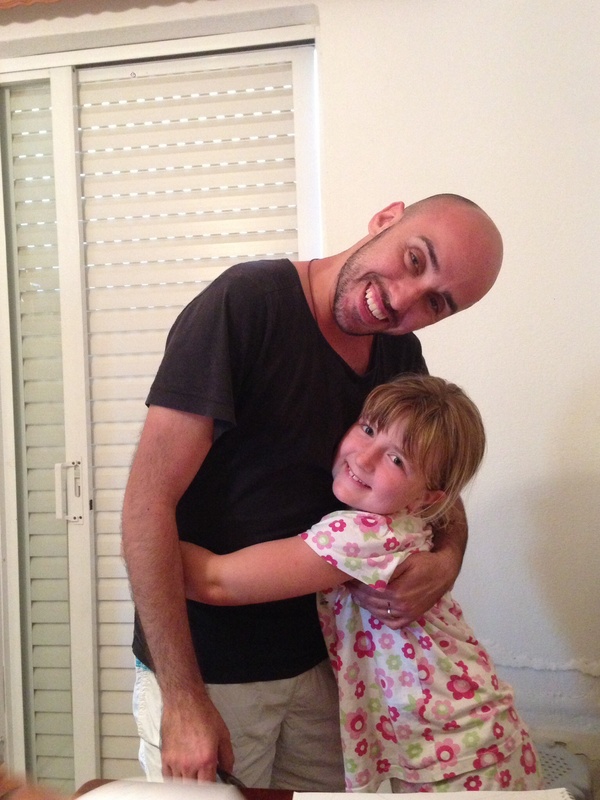 It was so awesome having him in Crete. Actually I love Chich the most. It’s funny how names develop. 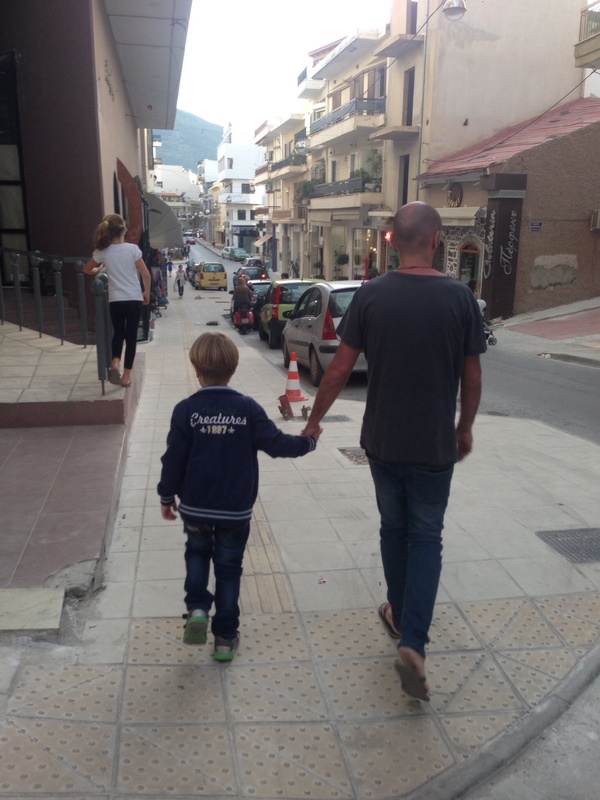 When Chich first became an uncle he decided he didn’t want to be called ‘Thio’ which is the Greek word for uncle so he picked ‘Chich’ which is the Macedonian word for uncle – now he is ‘Chich’ to us all. 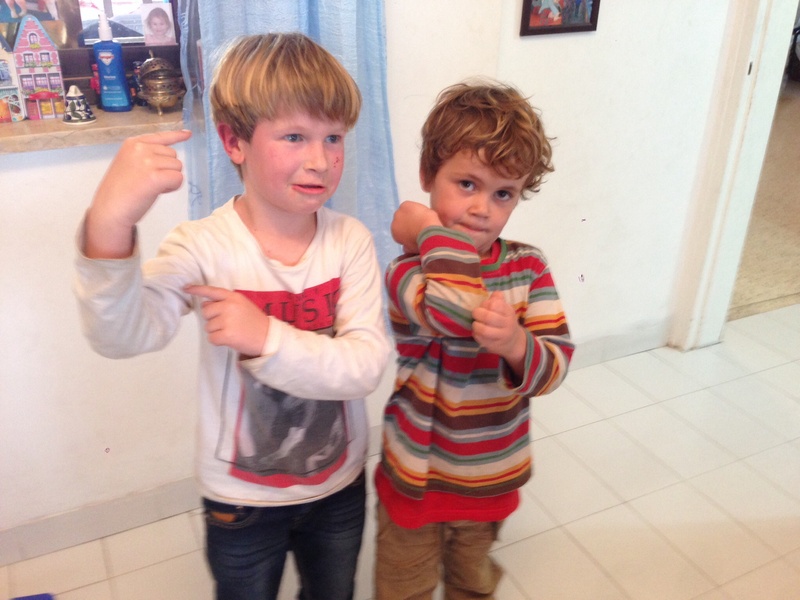 Hello this is Emilio – we left from our friends home today and we walked up a big hill but I got a taxi with baba and Yiayia because Yiayia can’t walk that far. 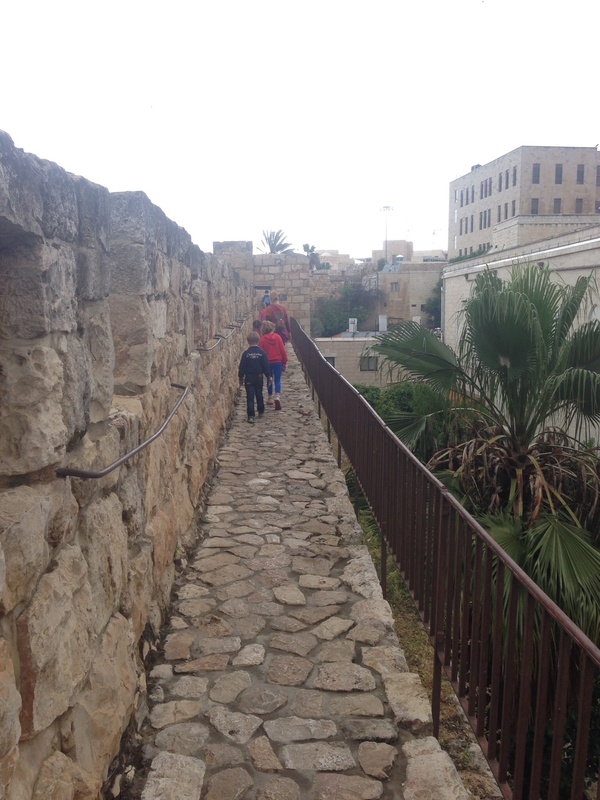 We walked on top of the wall of the old city of Jerusalem. 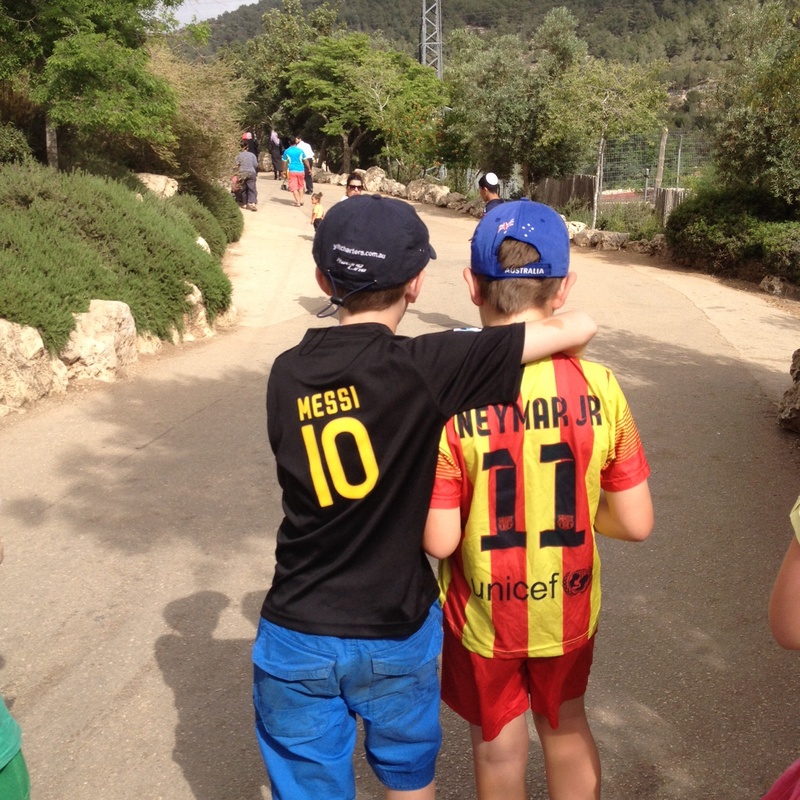 We started from Jaffa gate. 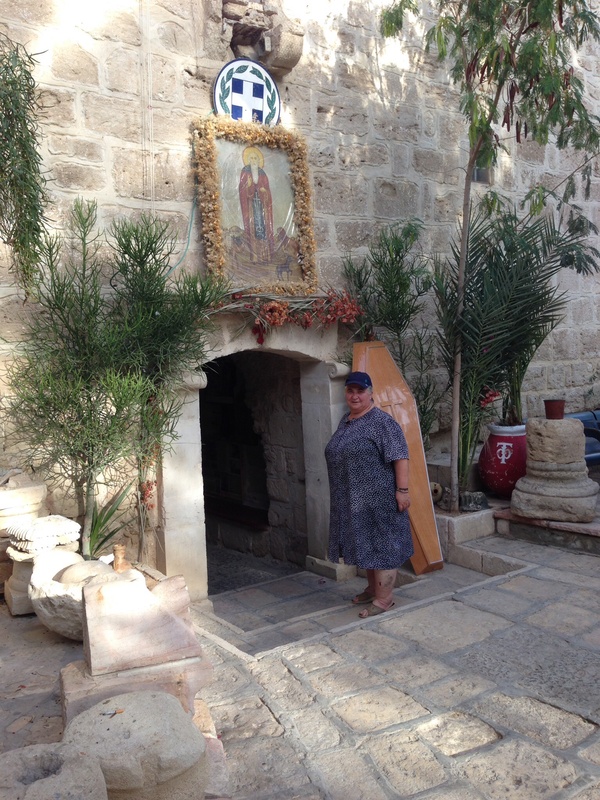 Yiayia didn’t come with us – she went on her own to a Greek Church. The wall was very fun. An old lady dropped a bag of tomatoes and we helped her pick them up. We saw three men playing music – I ran over to them and gave them some coins and they said ‘Thank-you’. 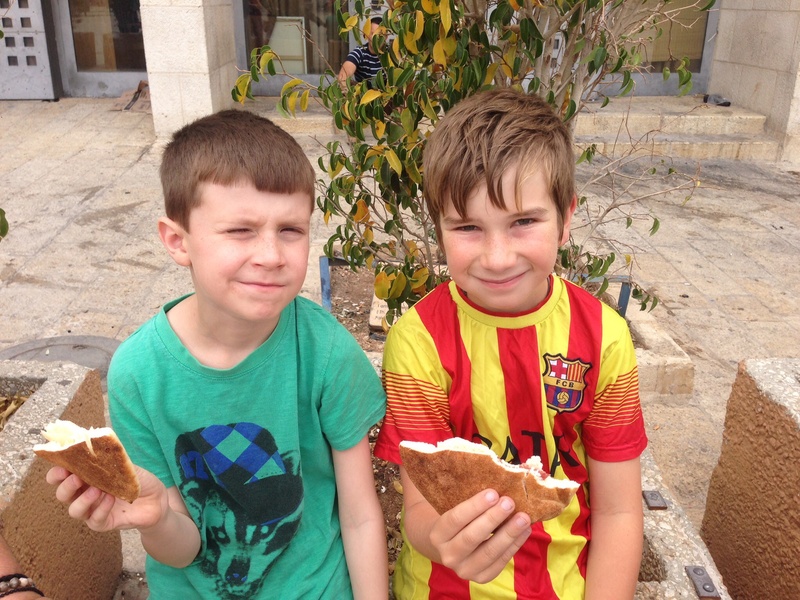 We walked all the way to Damascus gate and waited there for Martin and Carolyn and we had a souvlaki burger which was yummy. Then we walked to a cave that was really big and also fun because we found a little waterfall. 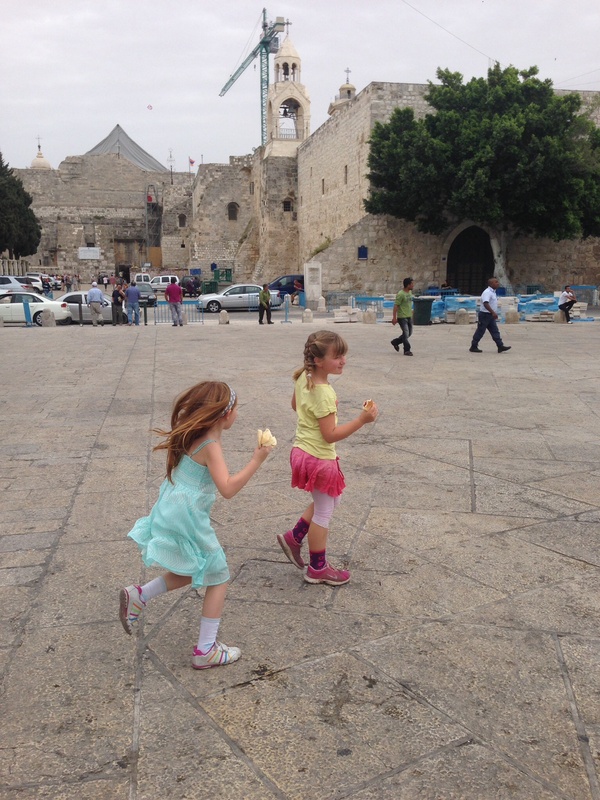 We walked all the way back to Jaffa gate and waited there for Yiayia. She was slow to come back so we went on the wall of the old city in the south part to a big wall where people were praying and clapping and singing. On the way home we saw some people climbing and being filmed for the television. Then we got home and played with the other kids who got home from school. 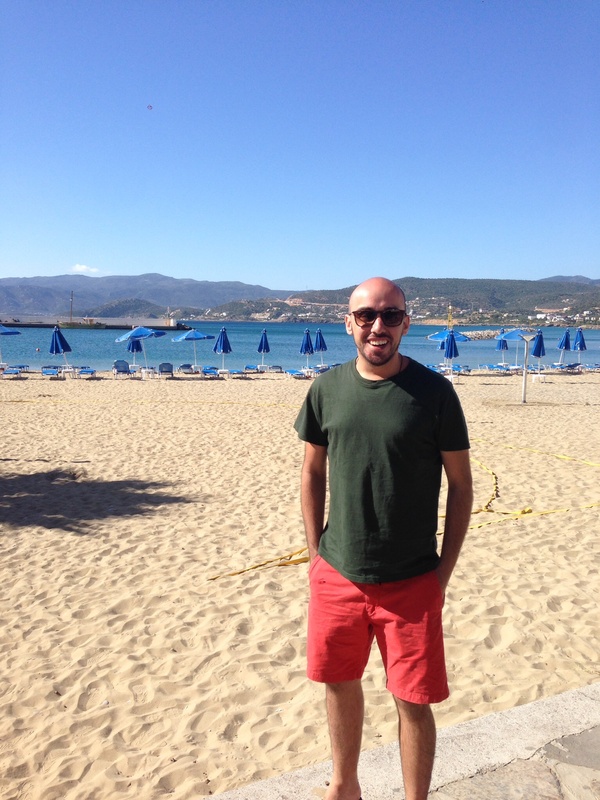 I better go and play now – goodbye from Emilio. loved playing with Zahra and her toys. She had such good toys. 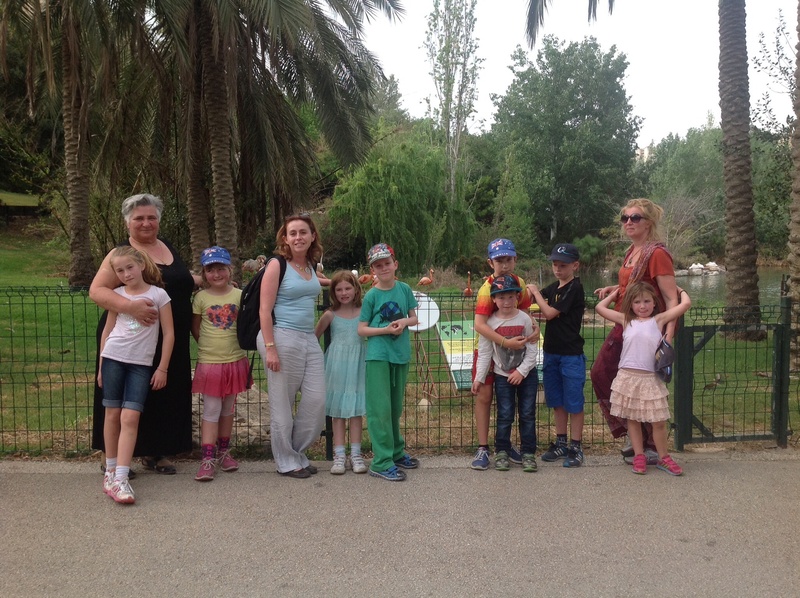 My best thing was going to the Jerusalem zoo for my sister Kalika’s birthday. 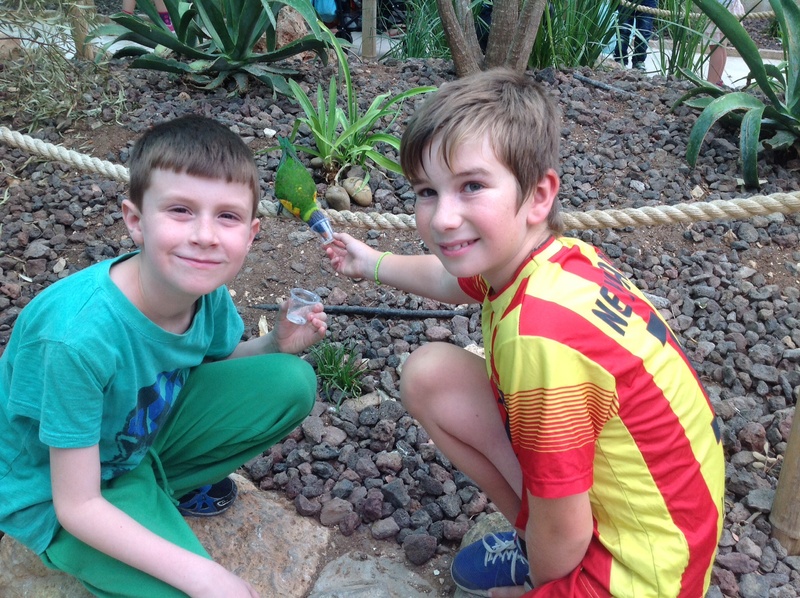 We got to feed birds some special food that they gave us. I really liked the waterfalls cause it felt nice to have the water going down on me. We had the boys from downstairs come to dinner with us and they were Gabe and Ned – Gabe was the little boy and Ned was the big boy. Gabe was very strong – he even got Emilio down in the tent. It was even funner with two more kids, but it was rougher. 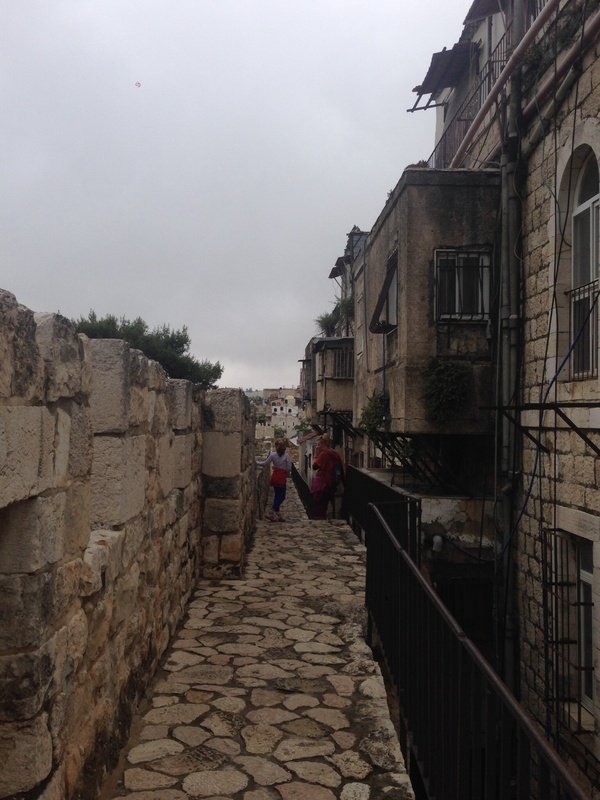 I loved running along the old Jerusalem city wall – but only a tiny bit cause our friends’ house was even more fun. Carolyn and Martin picked us up very late at night. 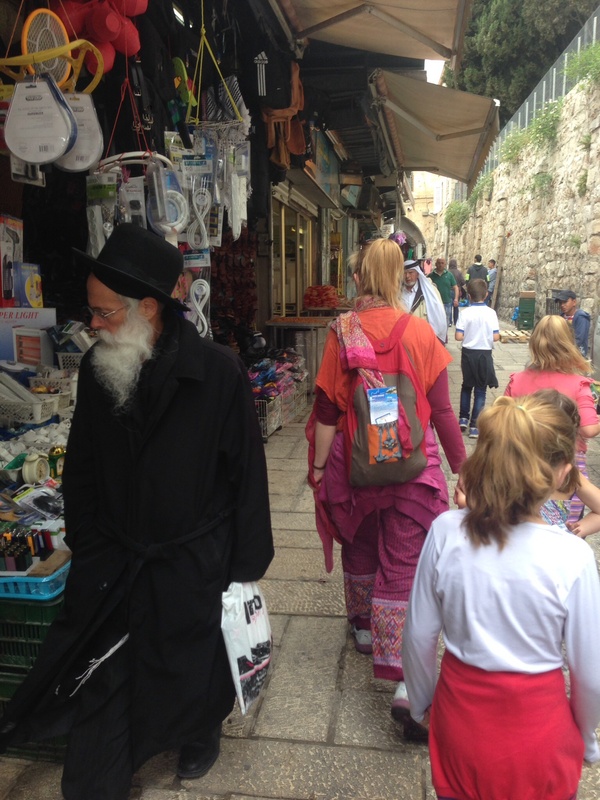 One day they met us at the old city and took us out for lunch and showed us some caves. Israel was so nice. It was wonderful to see these lovely friends of Christos and Sandy picking us up in the middle of the night. They took us home and they even gave me their bedroom – holy sweet Virgin Mary they were so nice. The next day they took us on an excursion to a nice national park and waterfalls and they helped me to get under the waterfall – it felt so nice. 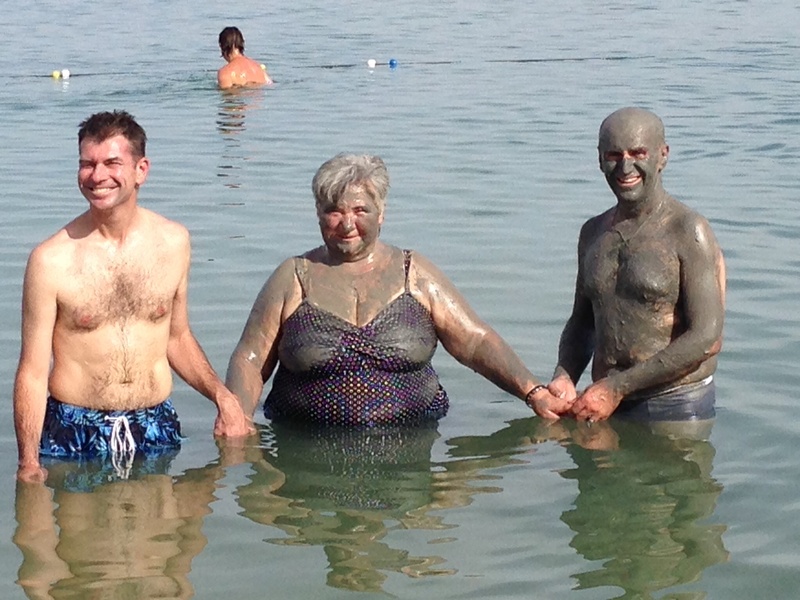 Then we went to the Dead Sea where they plastered me in mud and they helped me to get in the water. Toby got me in the water first and told me I would float but I got scared cause one leg was going up and the other on the ground. I got a fright. Toby was laughing and some other tourists had to help me. 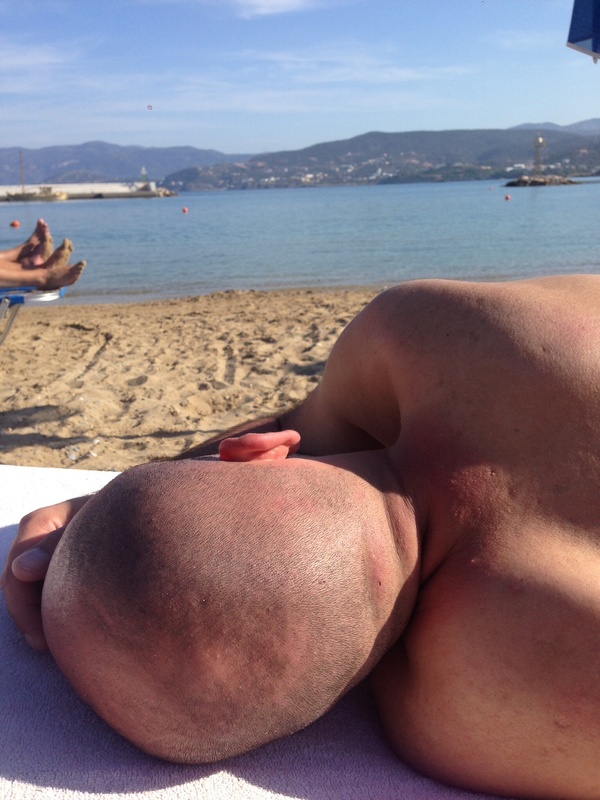 But then Martin and Christos held my hand and we went in and I floated. It was very good for my legs. Then we had to climb up the big hill again. 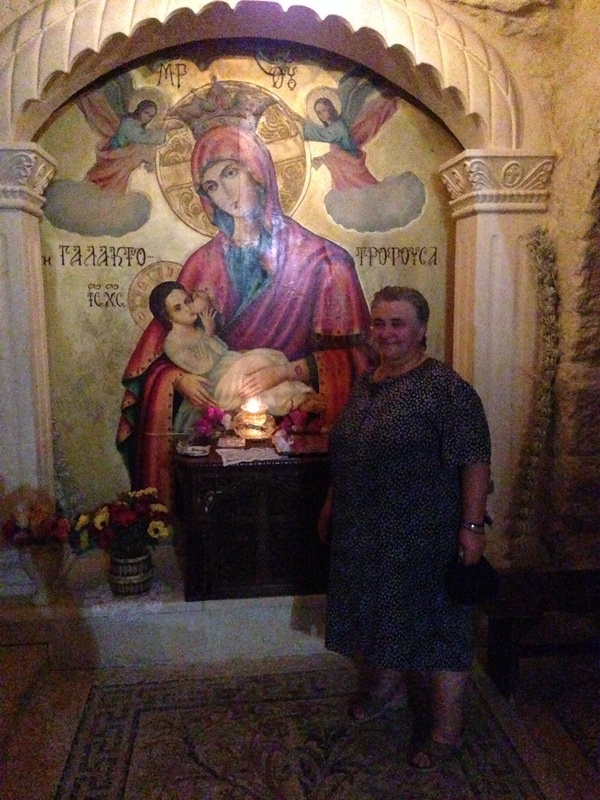 We went to a monastery called Agios Gerasimos near Jericho and it was nice to light some candles there. 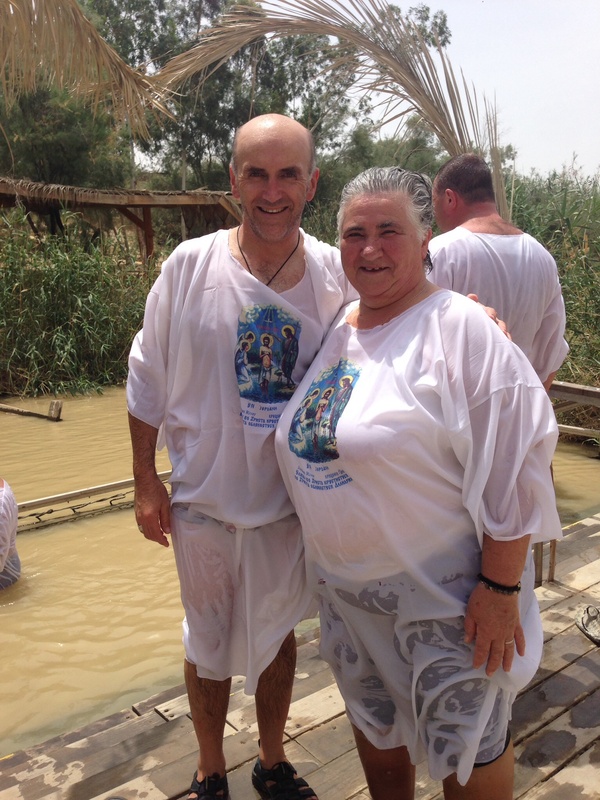 We went to the Jordan river where Jesus was baptised and we dipped in the water too. It was so nice and very weird that one side was Israel and the other was Jordan. There were guards on both sides. We went to the old city of Jerusalem to a church called ‘Naos of St Anastasios’ where Jesus tomb was and where he was crucified. 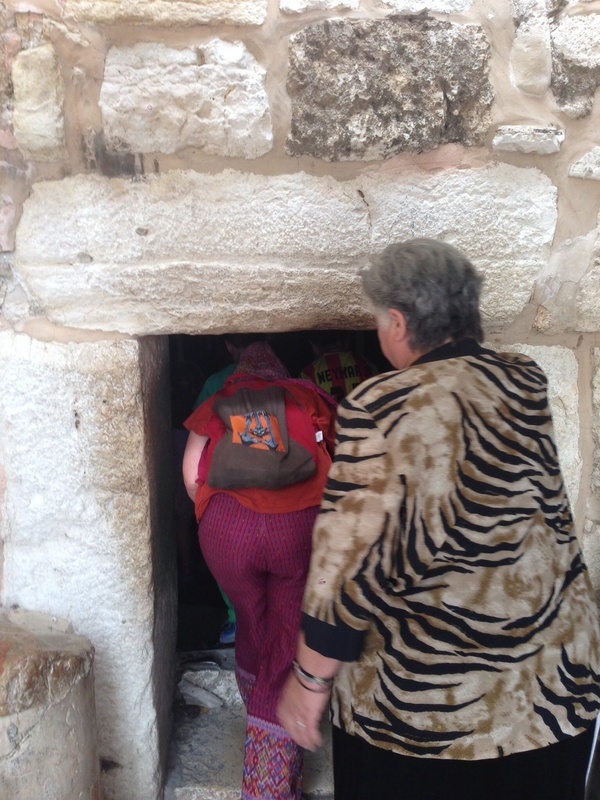 We also even went to Bethlehem – I got to see were Jesus was baptised, where he was born and where he died. I felt very good. 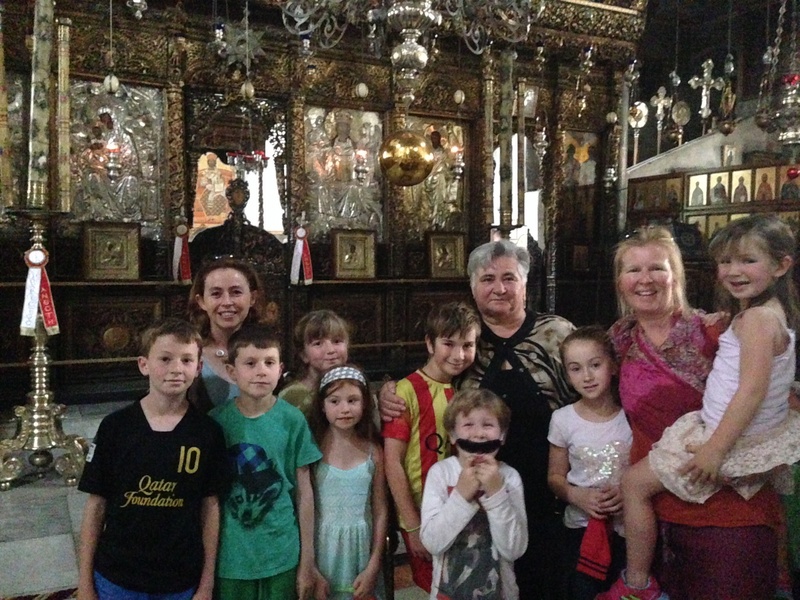 We met the man who is the key-holder for the church of Anastasios where Jesus died. He was very nice and told us stories. Martin and Carolyn and the kids were such nice nice people. The last day we all cooked together and I made them a cheese pita. We had a short rest and then they had to take us to the airport at 1.30am because we needed to have 3 hours to go through security at the airport. So nice of them to drive us. 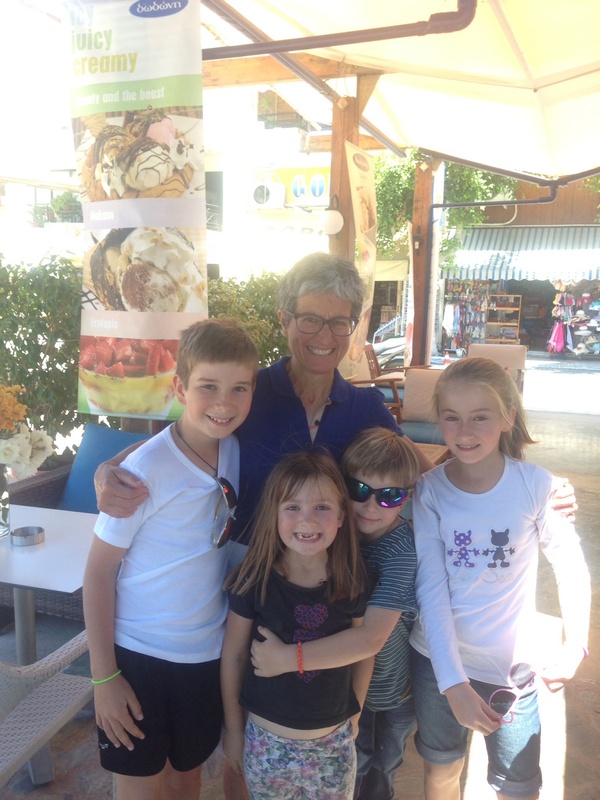 I’m so so glad we had a trip to Israel – the highlight for me was definitely seeing our friends Martin and Carolyn and their absolutely gorgeous kids – Alex, Marcus and Zahra. 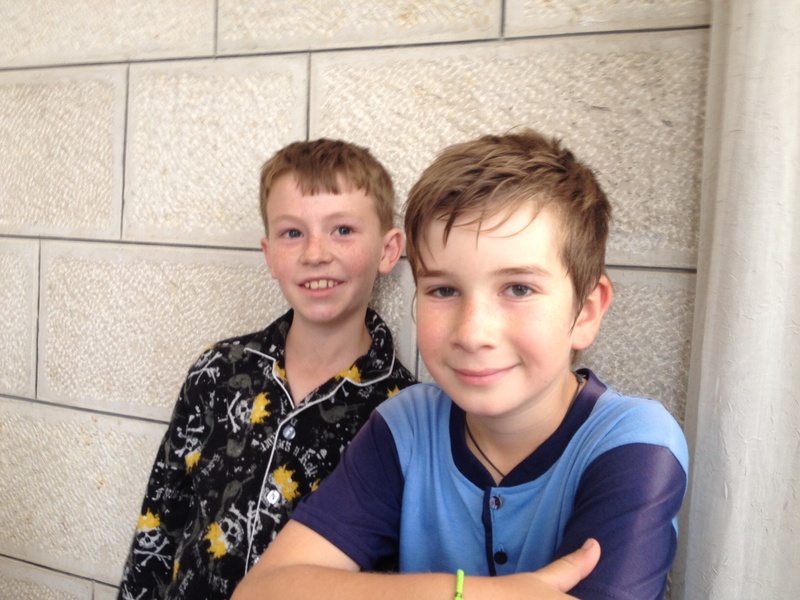 I was really touched when I read Toby’s blog and he said it was like they were best friends forever within 10 minutes – and that is what it felt like. I’m sure we’ll have many more family holidays with this amazing crew. Second highlight was definitely my mum’s excitement at being able to visit all the religious sites we managed to squeeze in. One day she said ‘I don’t know how I can ever repay you – I’ve seen Christ’s birth, his death/resurrection and now his baptism’. She was genuinely so excited. 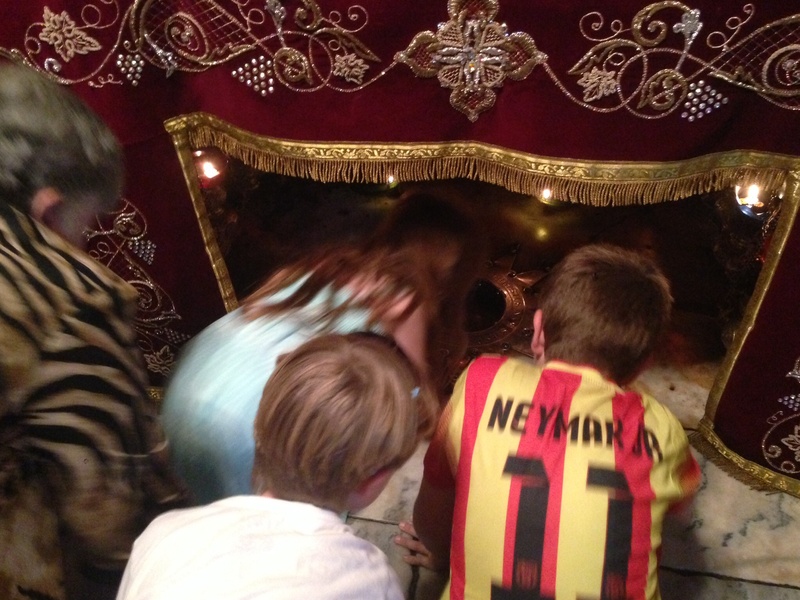 It was also interesting how much religion has rubbed off on the kids. 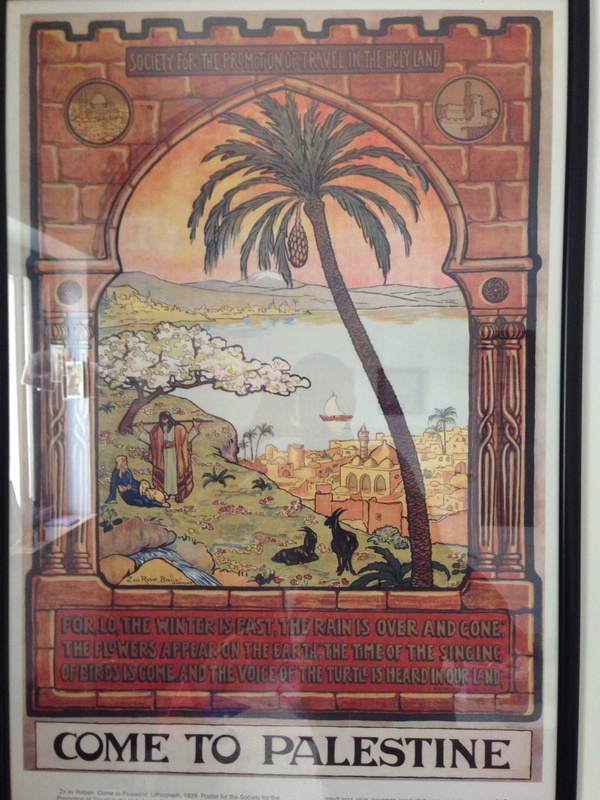 Sandy and I are spiritual and I believe in the sanctity and appreciation of all religions. However similar to the pope’s recent comments I believe that all religions deserve respect and under all that humans have interpreted from them they all have the basic principles of love, faith and respect for one another. We have baptised our kids because it was important to my family and they have gone to church whenever they are with my parents generally. Anyway what I’m trying to get at is how excited some of them were to experience the birthplace of Christ, or the church that housed the important stages of his death etc. 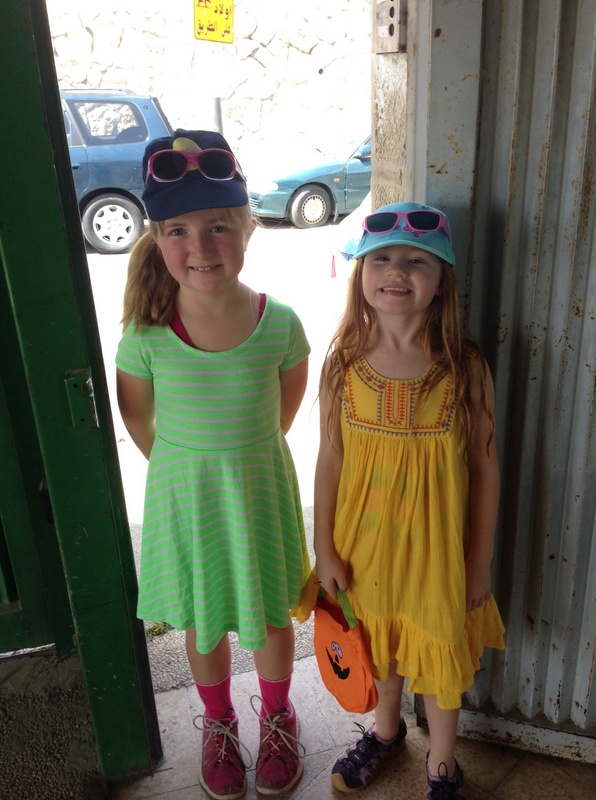 So many more highlights – getting to go into Area A of the West Bank. It’s all very complicated but the Palestinian areas are split up into Areas A, B and C. As I understand it Area A is where the Palestinians have most rule and are Gaza and areas of the West Bank though only 17% of the West Bank or the area that was Palestine before the 1967 war. In the areas A it is very very difficult for the Palestinians to get out through the checkpoints and Israeli Jews generally don’t go in. 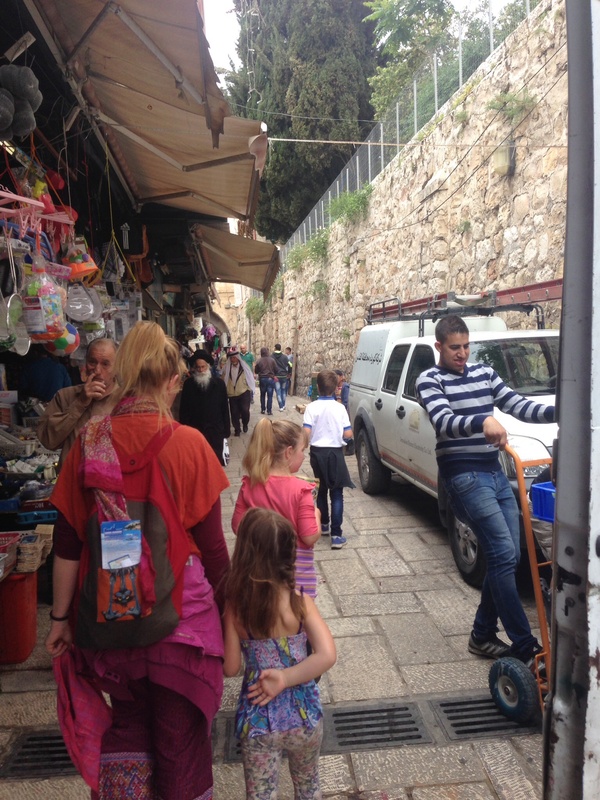 The two places we went to in areas A were Jericho and Bethlehem which were both brilliant and eye opening – how a simple checkpoint can make the world look so different. I found Jericho so laid back and relaxing and the ‘Lemon Tree’ Restraunt we went to was so delicious and great entertainment for the kids. 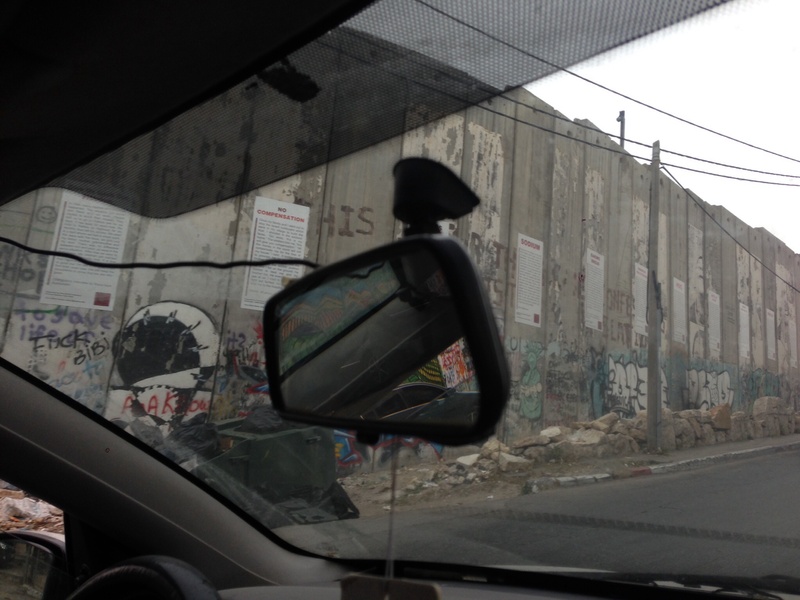 As I mentioned in a previous blog Bethlehem was a bit more stressful for me as I realised we weren’t insured with the car we were driving and the wall Israel built around the city made it look a bit bleaker to enter into to. At least we had freedom of movement due to our passports which is very different to the lives of most Palestinians. 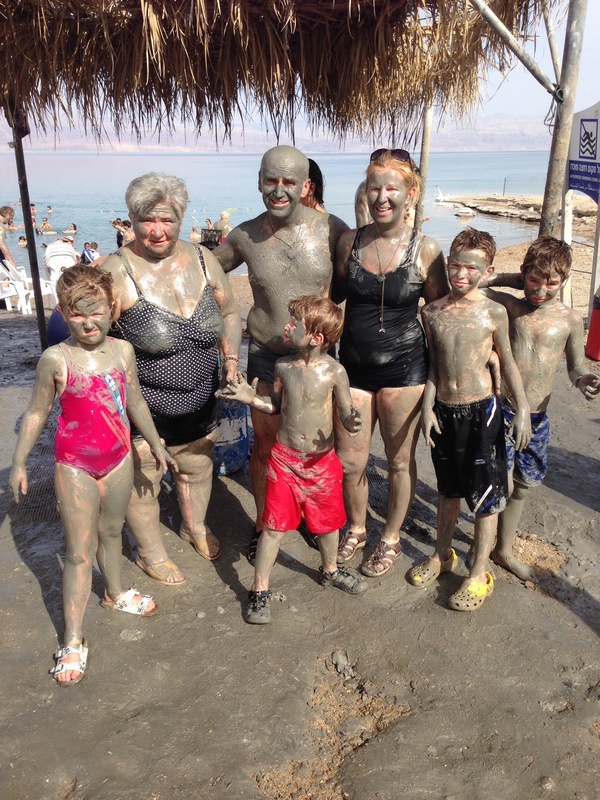 Israel hasn’t really been a burning destination on my personal list of countries to visit. We basically went there mostly to see our friends and to make one of my mum’s lifetime dreams come true. However it was so brilliant in so many ways. Having said that though – I found it incredibly difficult in so many ways also – the systematic and blatant discrimination against the Palestinians was quite difficult to bare. Most of the people reading this blog will be used to hearing the words ‘West bank’, ‘Gaza’ and ‘Two state solution’ on the nightly news a few times each week. A comment of the homeland minister was ‘of course Israelis who marry Palestinians have the right to live together – just not in Israel’. I heard that it can take up to 12 years to try to get residency for your partner if they are Palestinian with the Family unification visa. So basically if you are Israeli and marry a Palestinian it is not likely you’ll be allowed to love in Israel. Netanyahu himself said ‘we are a beautiful country in an ugly neighbourhood’. Senator John Kerry who is working on the Israeli – Palestinian Peace Talks described the situation as Apartheid. I would have to agree as in the city of Hebron which I read about and chatted to some people about, the situation there is quite apartheid like. There are many settlers in Hebron even though it’s in the West Bank. 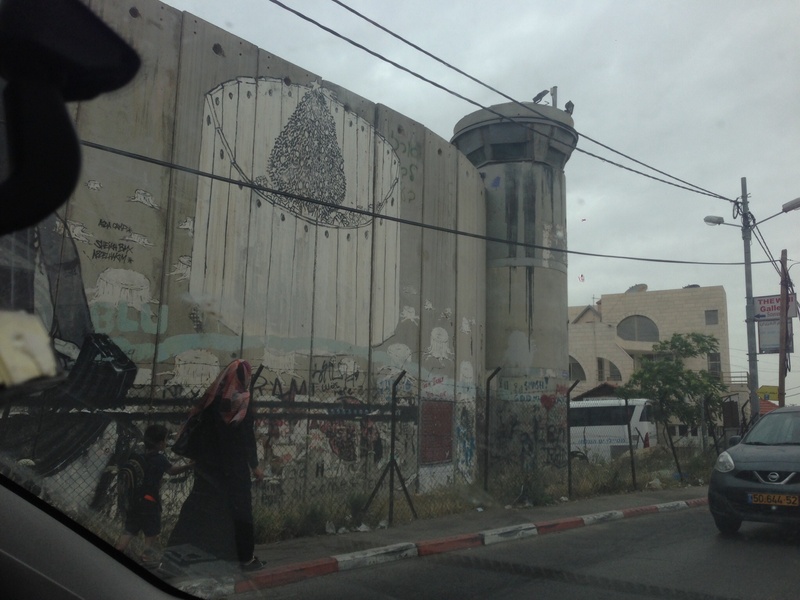 In the middle of the street there is a waist high barrier – Israelis can walk on one side and the Palestinians on the other. The only problem is that the Israeli side is 2/3 of the Palestinian side and the Israeli side fits a car to drive through but the Palestinians can’t drive there and aren’t allowed to. I was quite flabbergasted and wished it wasn’t true but alas it is. Now most governments around the world are not so nice to certain minorities or favour the rich and powerful etc but I guess I haven’t witnessed it so blatantly before on a personal level in front of my very eyes. In the area of East Jerusalem where we were staying – it is mainly a Palestinian area (I think Area C) though most of the houses don’t have permits so many of them are given demolition orders. Many people are able to get a stay off the demolition for up to 5 years but others aren’t so lucky. Out of all the building permits applied for by Palestinians, from what I hear, only 1% are successful. 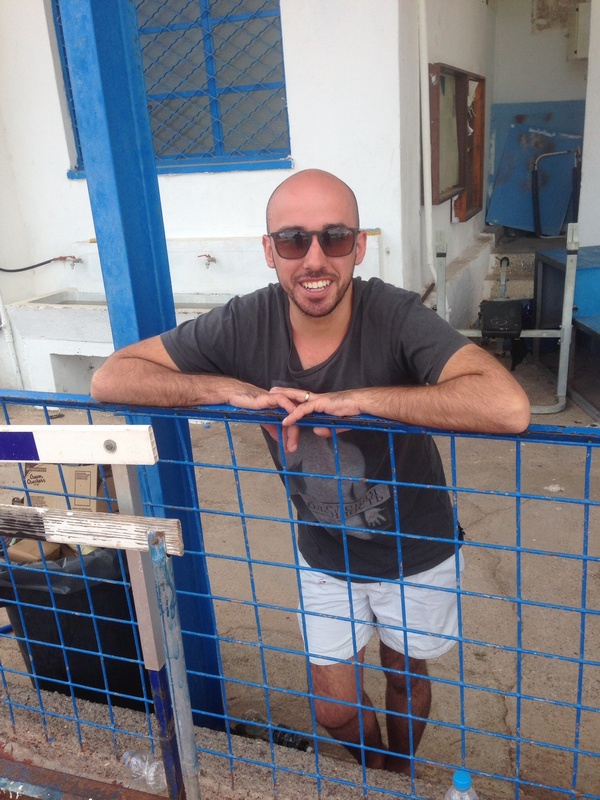 There is a law (I can’t remember the name of it cause most of the time I had my mouth open agasp and thought ‘are you serious – that can’t be right!’) that if a Palestinian is away from his house for more than 9 days then the Israeli authorities can take it in their custody. Just 9 days. Also if it is believed that the actual owner on paper doesn’t live there (ie/ a cousin lives in an uncle’s house) then again they can take it. It’s quite outrageous. 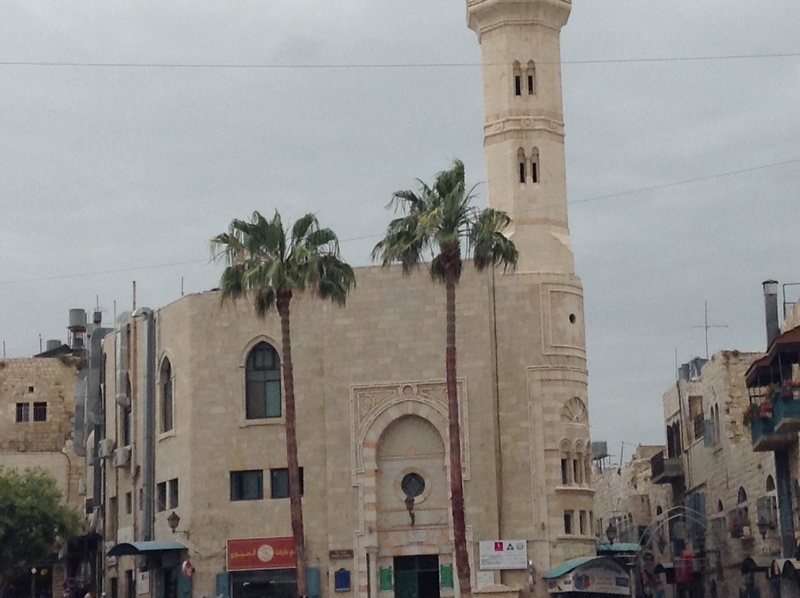 As I said we were staying in Palestinian East Jerusalem – though that is quickly changing also. 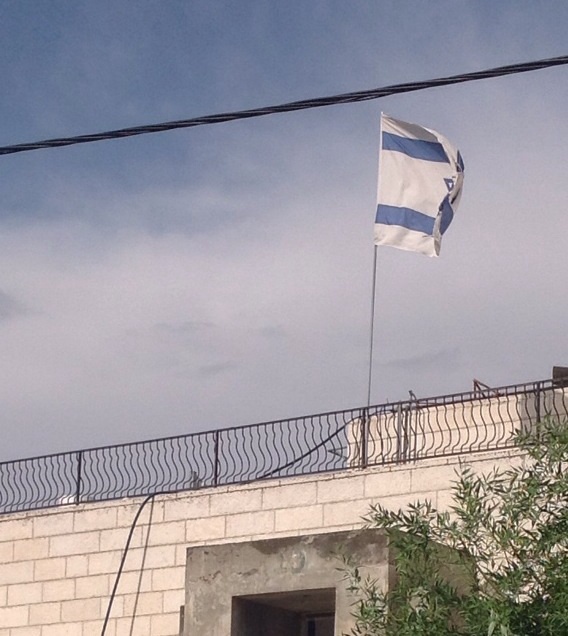 A few doors up there was a settler house (which means Israeli citizens have moved in and is often a house that is either seized by the authorities or bought through an agent in a predominantly Palestinian area of the West Bank). There was a massive flag pole on the roof with a very big flag and then also another flag like a curtain draped over the front door which was on the other side of big gates. There was also a guard on the roof pretty much most of the time. I just presumed that most settlers would want to live in Palestinian areas because it was cheaper to buy property but some want to live there because they believe it is there promised land. 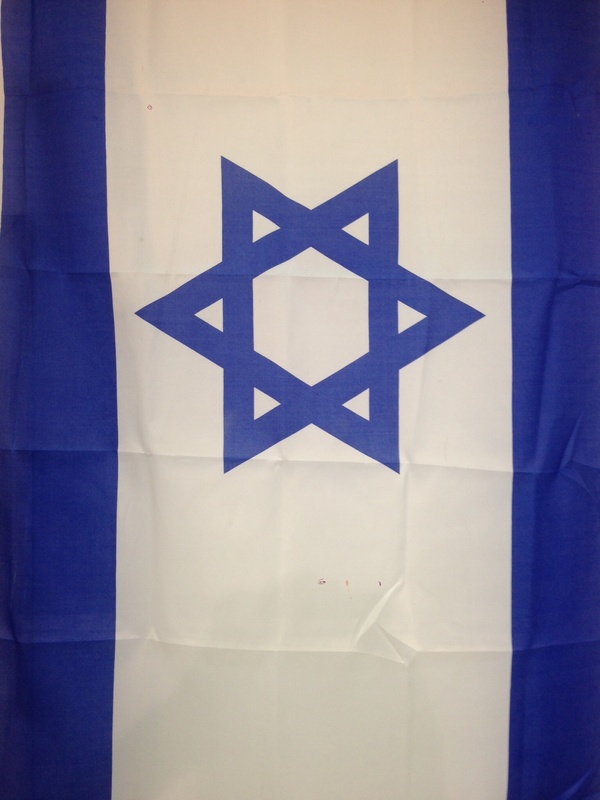 Anyway – back to the flags – I didn’t think it was quite possible that there could be anywhere in the world where there are more flags than the USA but it’s official – there are definitely more Israeli flags per capita in Israel. Walking past the big settler house I described earlier I was pretty amazed at the flags so I had to ask the question – where were all the Palestinian flags (I didn’t even see one). Well apparently if you put up a Palestinian flag you can be charged with inciting violence and whilst it may not be a ‘go to jail’ type of offence the police can go through all your family records and if you have any unpaid fines, other irregularities or your house is not ‘legal’ then you’re in trouble. Apparently if any settler called the police due to violence from a Palestinian then the police are there within two minutes (in Jerusalem) though there are many cases of violence from settlers where the police are much slower to react. This was very evident in a few videos I got to see of settler violence in Hebron. 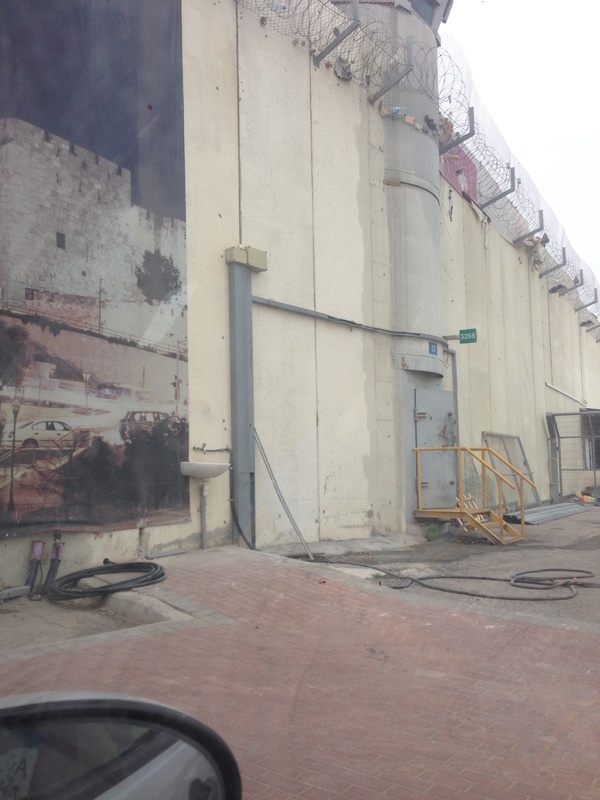 Gaza is literally an open walled prison. The borders are all closed, even the tunnels into Egypt are now all closed. The only way out is the sea and it is patrolled heavily – fishermen can only go out 3km and even then they are sometimes fired at. Gaza is 11km by 41km with 1.8 million people livings there. It is one off he most populated places on earth. Hamas are obviously not the most ’embracing’ government but the reality for most everyday Gazans is very bleak. There is not much variety of food in the shops. It is very expensive and there is only about 8hours of electricity each day – you can’t even run refrigerators on that – in the blistering heat. I almost got to the point where I didn’t want to read any more newspapers or hear any more stories because I found it quite outrageous and horrifying. I could go on and on and on about the wall and the ‘extra’ land the Israelis are taking in the name of security……..and about the Bedouin villagers that have their shacks demolished etc. One last unbelievable story I read about was that the Israeli army had created a firing range. Well they have to practise don’t they? Well yes they do, but there were 8 villages in between. So they had to move during the exercise……and what happens when they’re not in their homes for more than 9 days – yes they can’t come back. Shocking. I’m starting to sound anti-Israel though I’m not. I just agree with John Kerry in his description of the situation as Apartheid – it definitely is in my opinion. It’s a beautiful country that many believe could be governed in a much more humane way. The two state solution was all worked out with the division of land, the old city was going to be a UN protectorate, the Israelis and Palestinians were going to share Jerusalem as a capital. Peace could be achieved – but it was thrown into the wind because it wasn’t enough land. I believe that one day there will be a two state solution (as it was pointed out to me – the Israelis wouldn’t want a one state solution because they would be a minority) but the amount of land in the West Bank will be so small – due to the incessant settlements. To finish on a positive note, we had an absolutely awesome holiday. 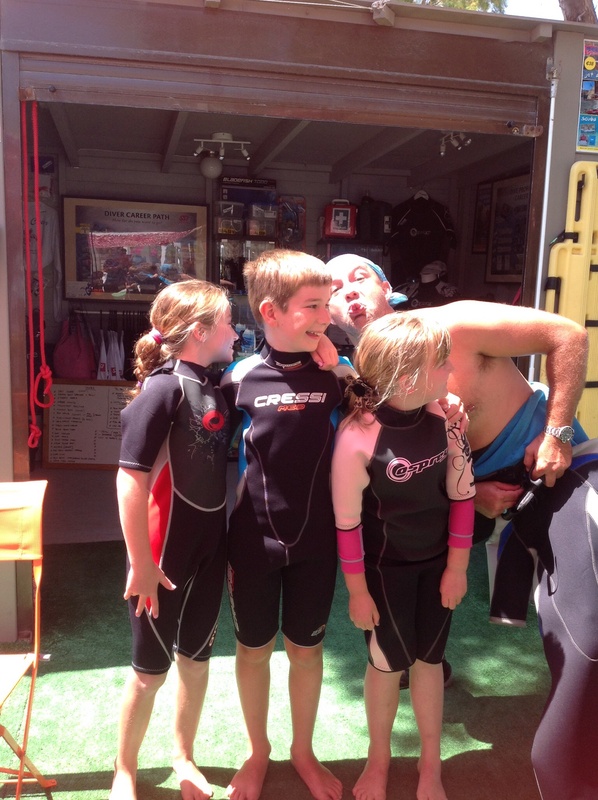 Carolyn and Marty were incredible hosts and our kids just gelled so so well. 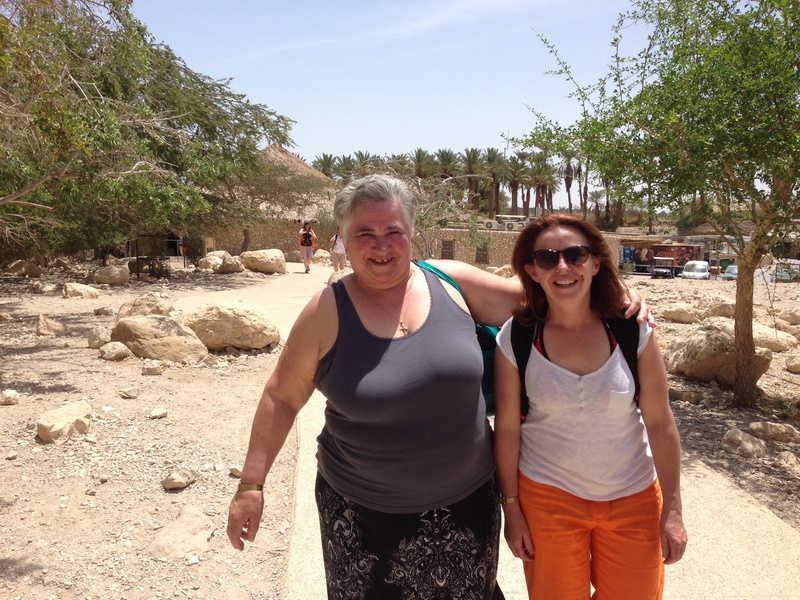 My mum had the trip of a lifetime with her visits to the religious sites. It was eye-opening and helped us to see the world in such a different light. 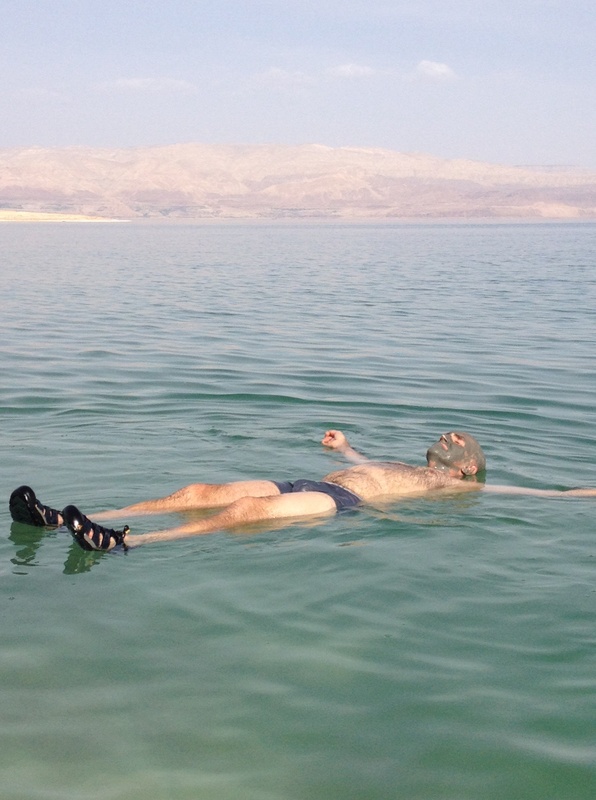 This is a picture of me in the Dead Sea – floating in the Dead Sea has been on my bucket list for so long – Tick! Staying at Alex and Marcus and Zahra’s house was lots of fun because they had fun things to do like table soccer, table tennis, wii and we made up a game where one person is standing up in a tent and the other person is outside the tent with a soccer ball and the person outside has to try to kick the ball at the person inside the tent who has to dodge. 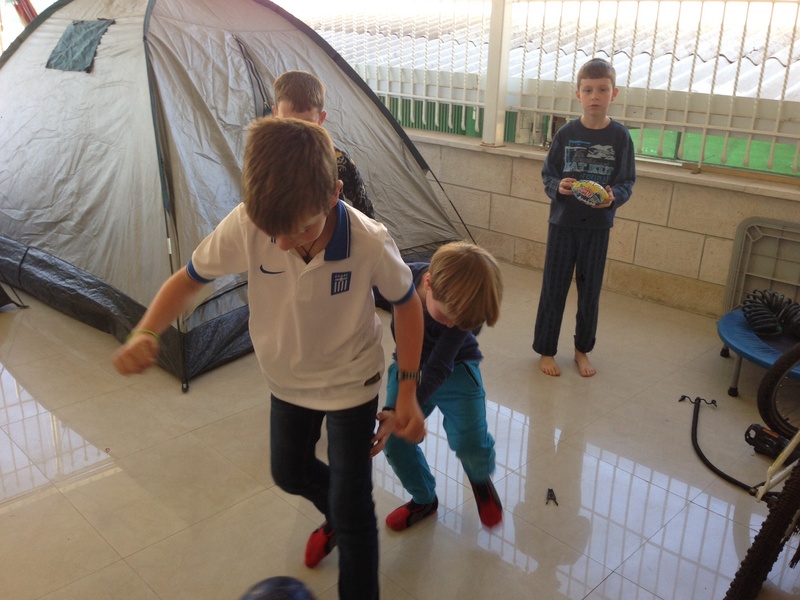 There was even room for tents on the front porch and indoor soccer. We played that game for hours. Alex and Marcus were fun to play with and we got along very well. 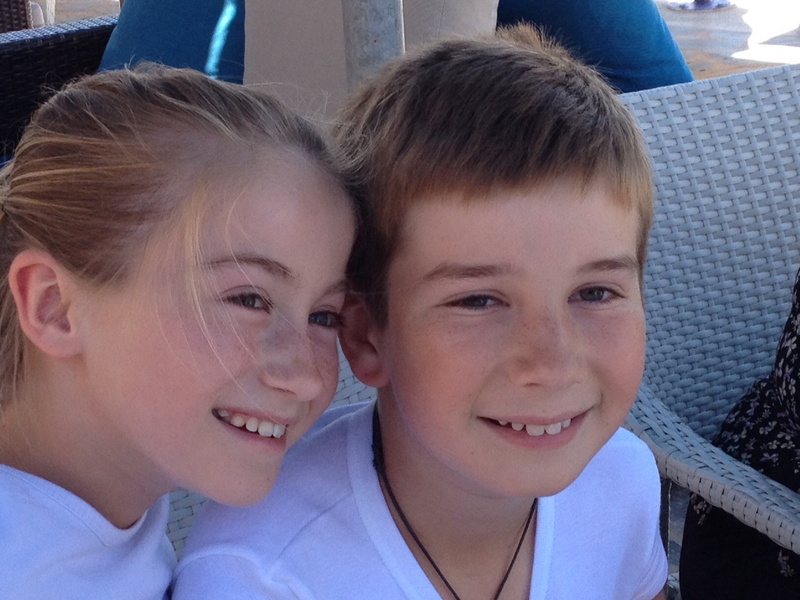 I just can’t wait to see them again and go on another family holiday with them. Mummy thought Alex, Marcus and I got along especially really well. 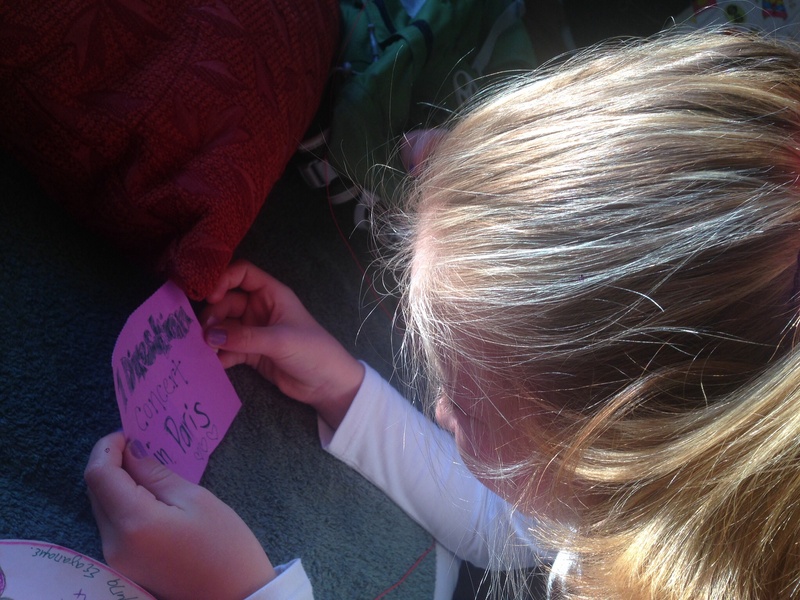 On the first morning we were playing as if we were best friends for all our lives within ten minutes. I slept in three different places. The first night we got in at 2.30am and I slept in a room with 5 beds. That night Marcus, Zahra and Alex were in tents on the porch. The next night I slept in the tent with Alex but the rooster over the road was very loud so we both moved inside on some couches where I had some of the best sleeps I’ve had for ages. On our 4th day in Israel we went to the baptism site where Jesus was baptised by someone who I think is called John. We had to go through a military area to get there and there were signs to say there were mines and to keep out but it was safe to drive to the Jordan river site where there was a car park. 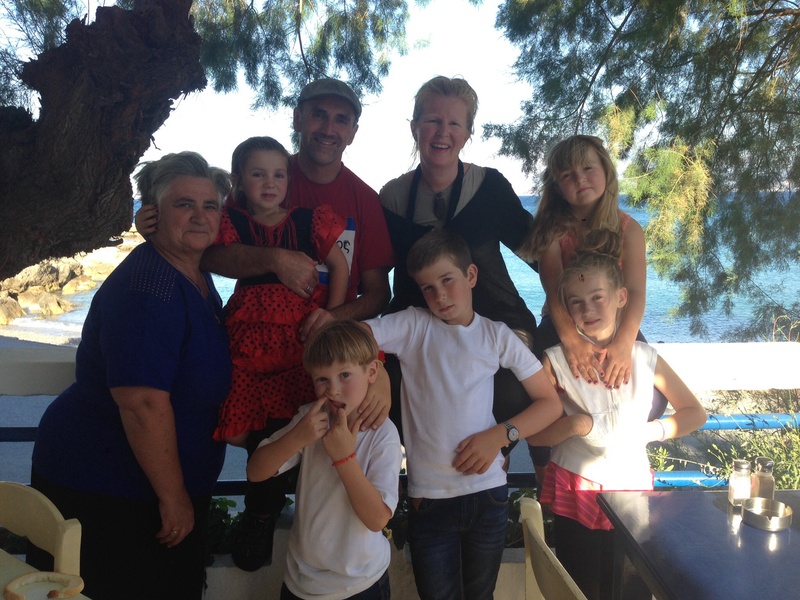 We all got our bathers on and Yiayia bought a dress type of thing that most people that went there were wearing. I just wore a normal top. Then we went into the water which looked quite brown or muddy but felt very cool. Can you believe that’s Jordan on the other side? 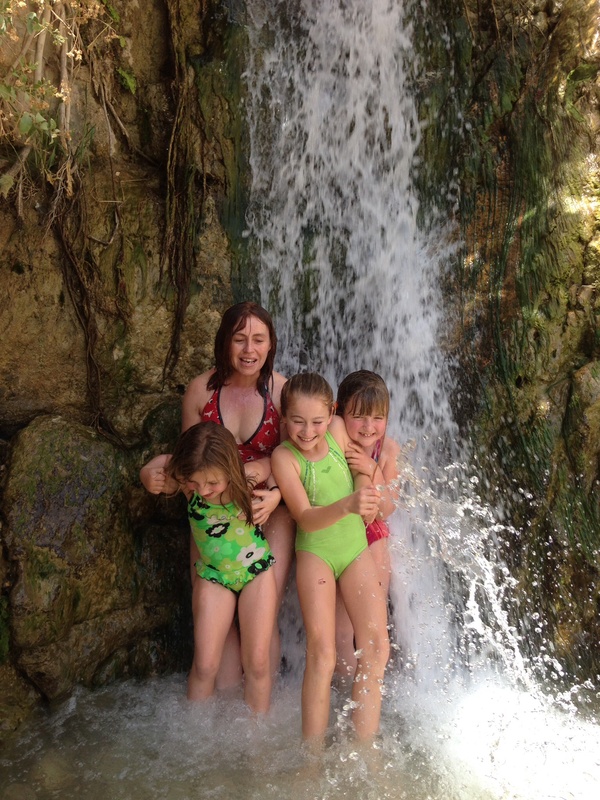 We ducked into the water and had some fun splashing around. 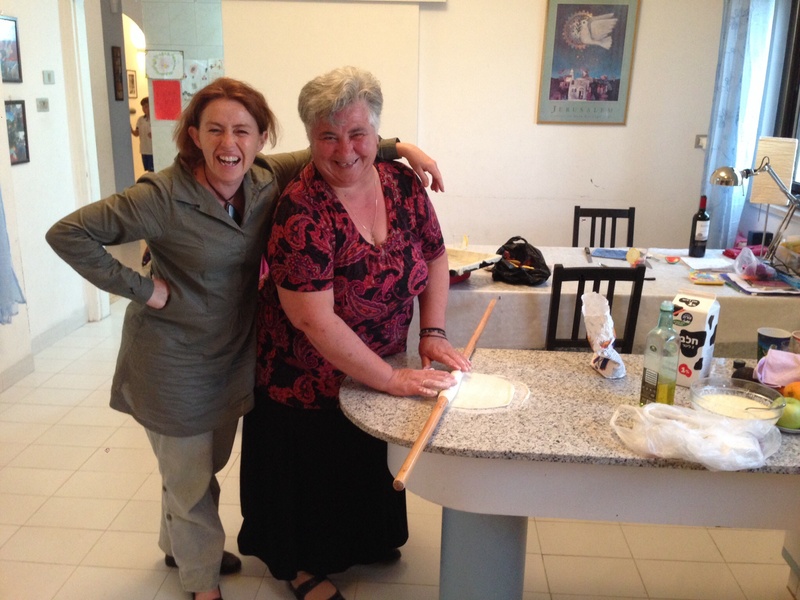 Yiayia went in as well – she has trouble walking but she always walks far and does special things like this. Though I think she’s walking better and has lost a little bit of weight since she’s been here. Baba wore one of those white tops also so that he could give it to Papou. 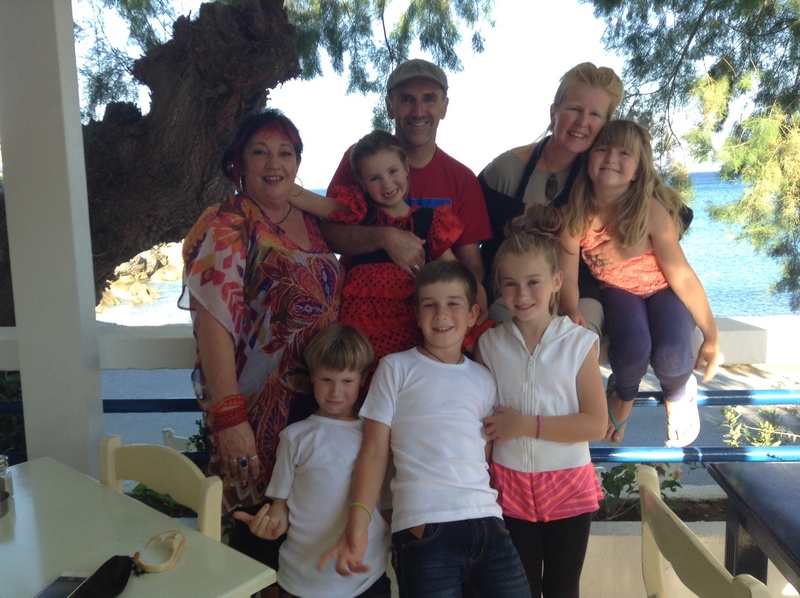 It was very hot that day so we stopped in at a Greek monastery to have an ice-cream and a look around but I was desperate to get home before Alex, Marcus and Zahra got home from school – and we did and it was so much fun playing with them again. 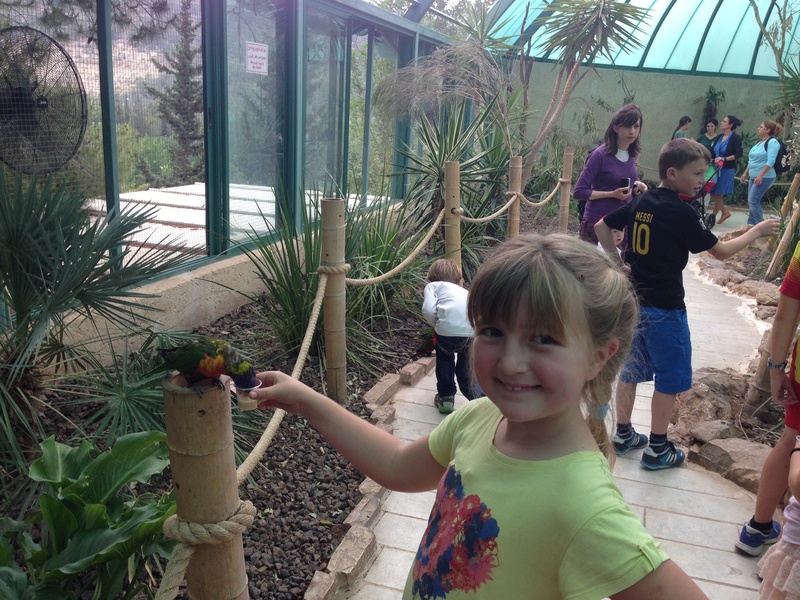 Our friends, Zahra, Alex and Marcus, had a day off school on my birthday and we went to the Jerusalem Biblical Zoo. It was awesome fun. 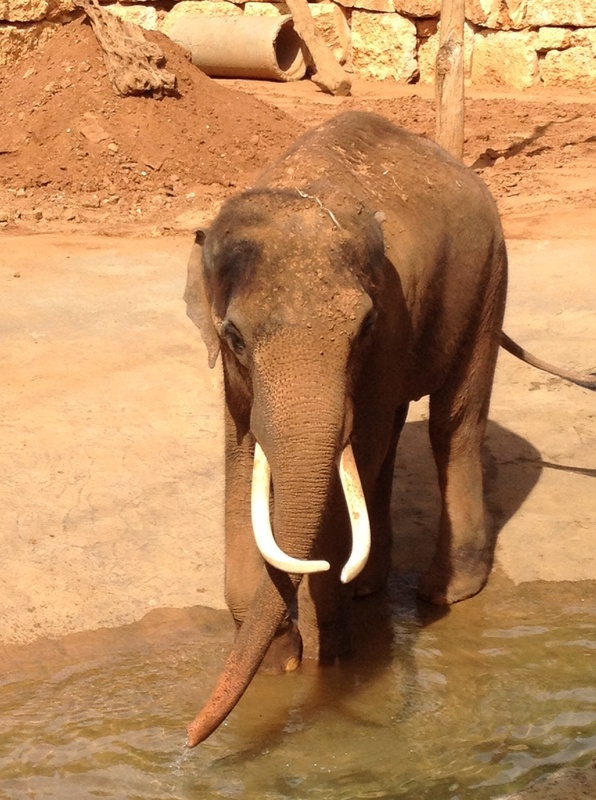 There were lots of animals like elephants, monkeys, frogs and snakes. 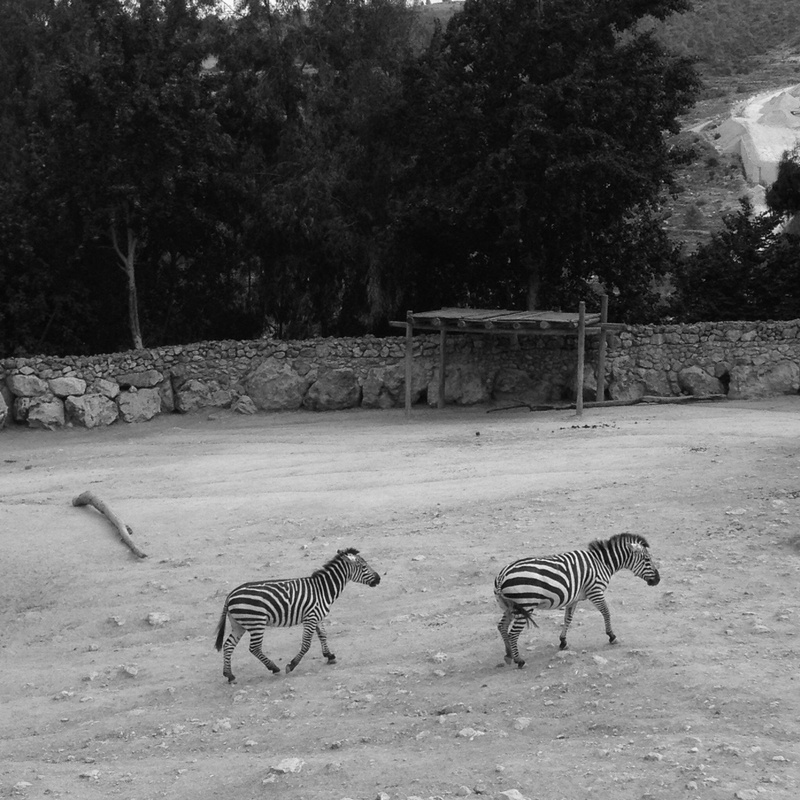 There were two zebras – one was biting the others bottom and the other zebra was kicking it in the face with it’s back legs – as if to say ‘stop it’. It was so funny to watch. We went to a cafe which was on a boat called ‘Noah’s Ark’. There was a little cinema there where we watched a short movie about a man who collected animals and gave them to the zoo. We got a little cup of sort of milky nectar stuff to feed the birds. 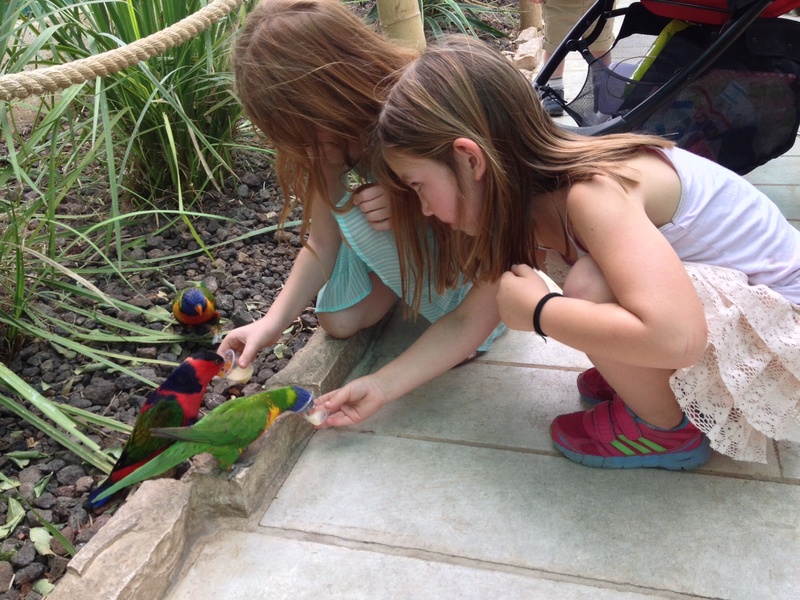 When you wanted to move on and feed another bird they would hold on to the little cup with their claws. One of the birds bit me and it hurt so much I spilled so much of the nectar. We were playing a game where we had a space ship and Toby and Alex were the bad guys. They were going to wreck our planet and we had to save it. We won. 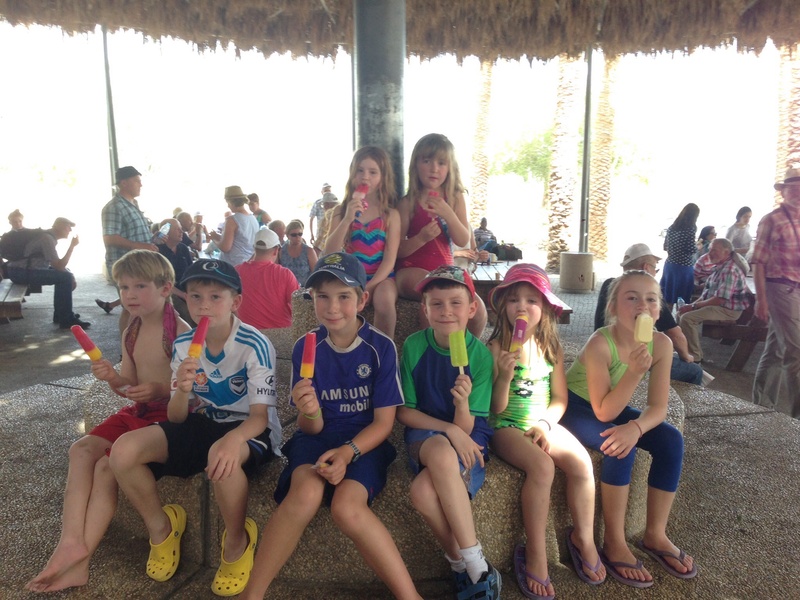 When we were back at the entrance we had an ice cream which was nice cause it was very very hot. I had a silver coated magnum which was so delicious. For my special dinner we had lasagne and an amazing salad. it was really really yummy and Carolyn is the best cook. After dinner we had the best cake – it was a berry cheesecake. It was so awesome because there was a rocket fireworks candle in the middle and it went up sparkling. For my birthday I got the movie Frozen from mummy and baba and three vouchers. 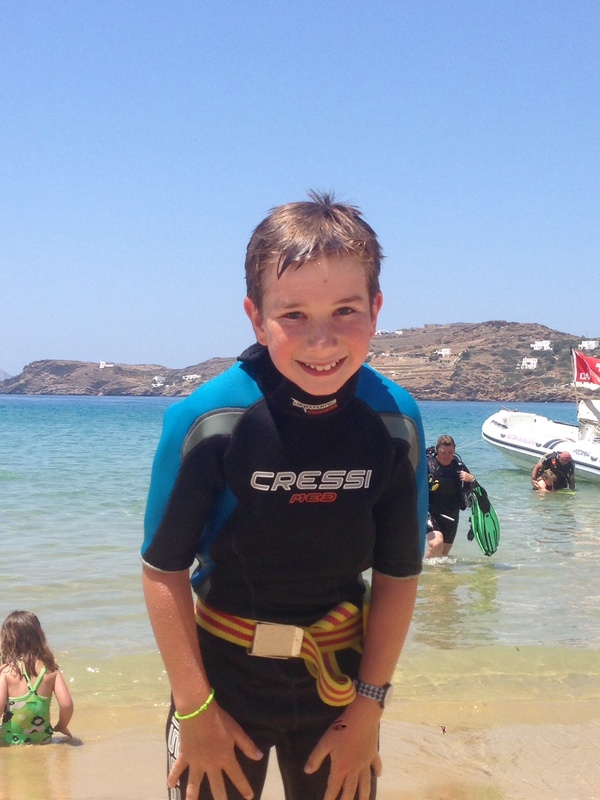 One was for the Jerusalem zoo, one was to go scuba diving with our friends in Ios and also the other was going to a water park in Crete with my friends Isabella, Manolis and Alex. From Carolyn and Martin and the kids I got a babushka doll to make out of fabric, a notebook and a mask making kit. They are awesome. I also got some cards and loom bands from my grandma and uncle Ricky’s family. 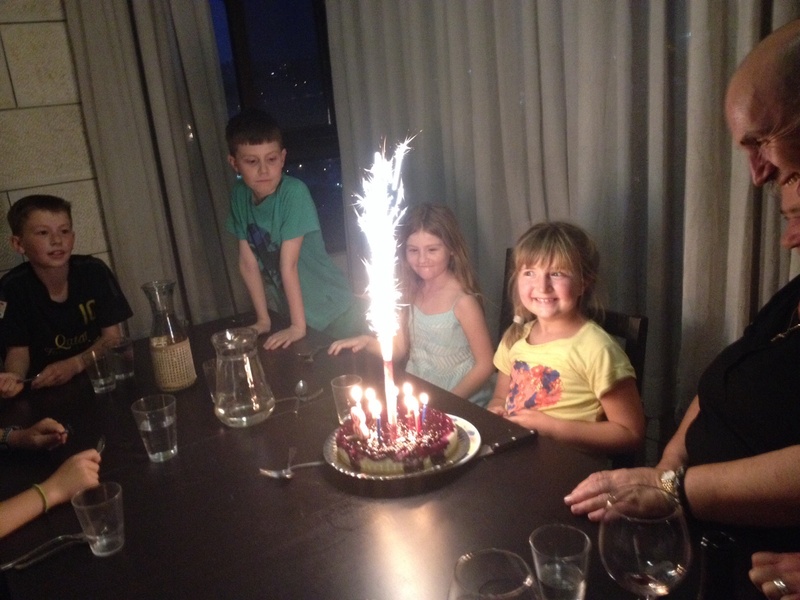 It was an awesome birthday but I also wish my friend Charlotte from Australia was there. I miss her so so so so so so so so much. 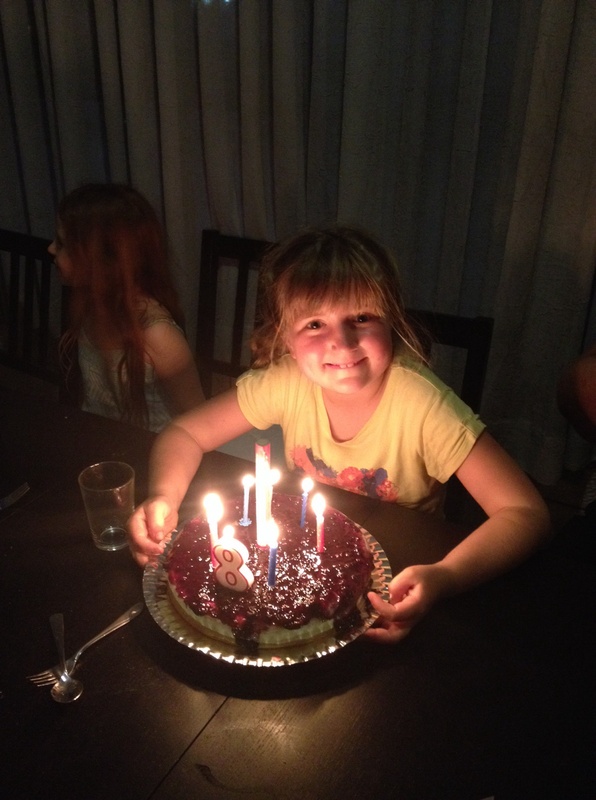 I’m so glad that Kiki had a great birthday – Carolyn and Martin were amazing hosts and helped to make her day fabulous. Before we went to the zoo we thought we would make a side trip to Bethlehem to see the birth church of Jesus. It was definitely an eye opener. Bethlehem is in Area A which means it’s under Palestinian control but also that you have to go through a checkpoint – getting in didn’t take too long cause we showed our Greek/Australian passports but it dawned on me that when we got in – the hire car that Sandy was driving and following Carolyn isn’t insured in the West Bank. I was so so worried of having an accident because it would mean our trip was over and we would have to come home if we had a car bill. Anyway – all was well in the end and I was so glad that Sandy was driving cause I can be a bit of a stress head in very built up busy areas, especially parking in tricky situations. Anyway – we got to the church and saw the line of people that wanted to see the birthplace – my immediate thought was ‘we don’t really need to see it that badly’ (I just don’t do lines). However Carolyn chatted to a guide and it wasn’t too expensive and he quickly whisked us into a procession and put candles in our hands so we looked like we were there from the start and straight down to the birth chamber. – it was wonderful to hear the Franciscan monks chanting during the procession. So we were in and out of the church within about 1/2 and hour. 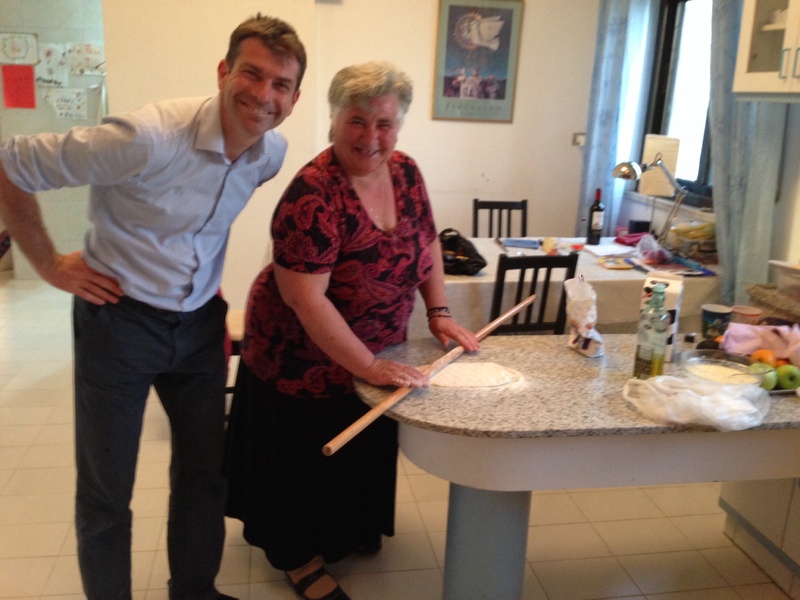 A very efficient visit and Yiayia was ever so pleased. The kids loved playing chasey in Bethlehem square while the Sandy and Carolyn picked up the cars from goodness knows how far away they had to park! 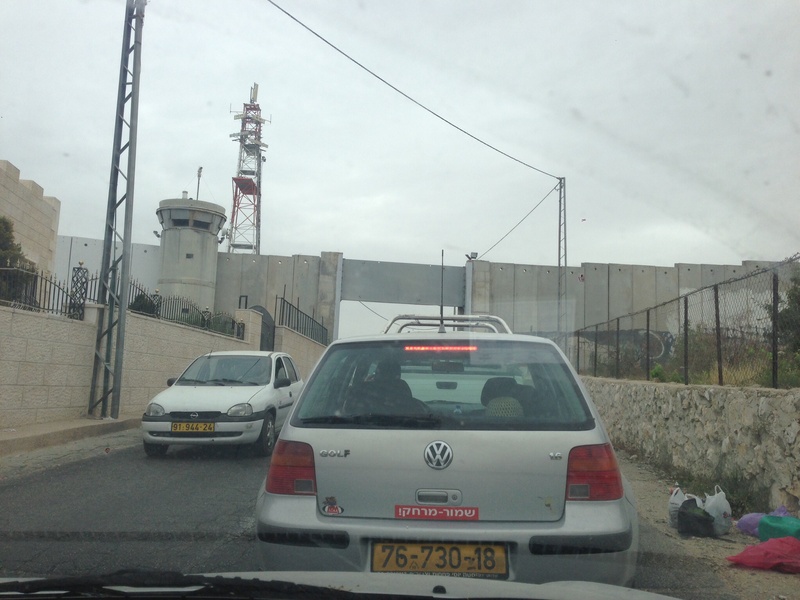 It took forever to get out through the checkpoint – driving along the imposing wall. Tuesday 6th of May was Israel Independence Day which means that the checkpoints were closed to all Palestinian traffic – they couldn’t get out even if they worked in ‘Israel’. 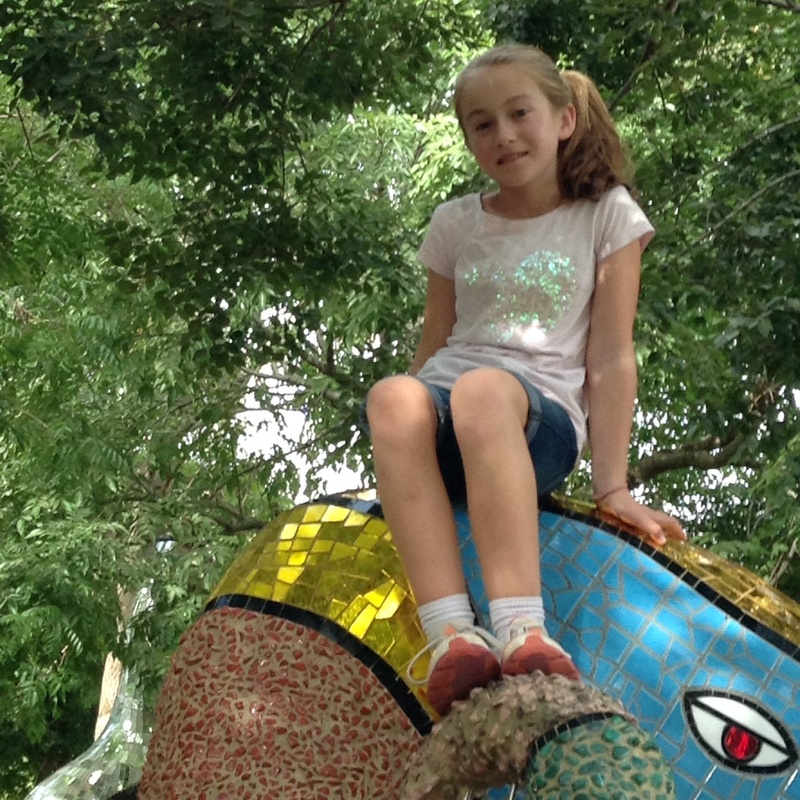 Anyway I breathed a sigh of relief when we got through the checkpoint and our car was insured once more – and on to the zoo for Kiki’s special day.